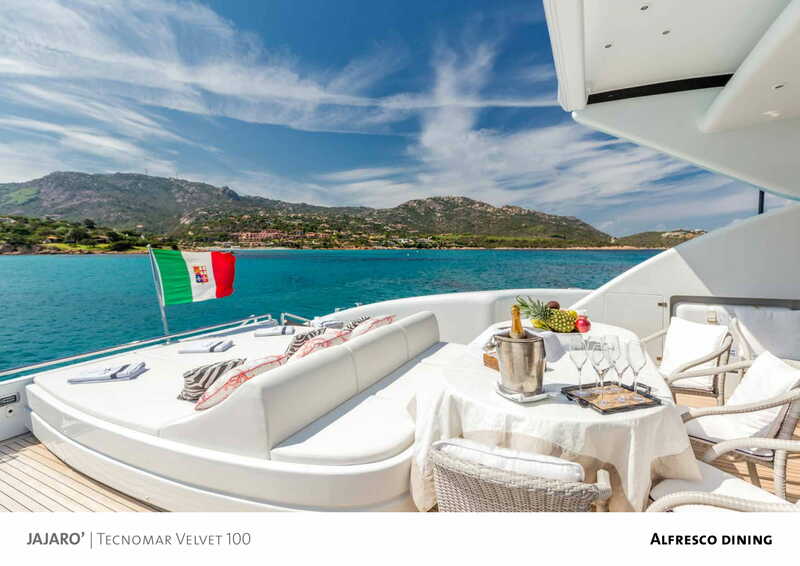 Jajarò is a planing motor yacht, resulting from the design of the ar- chitect Luca Dini and from the careful work of Tecnomar shipyard. 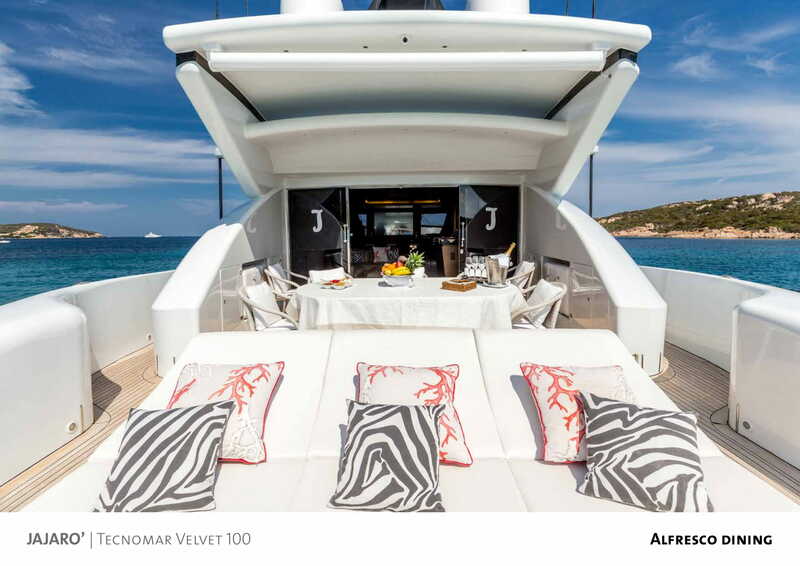 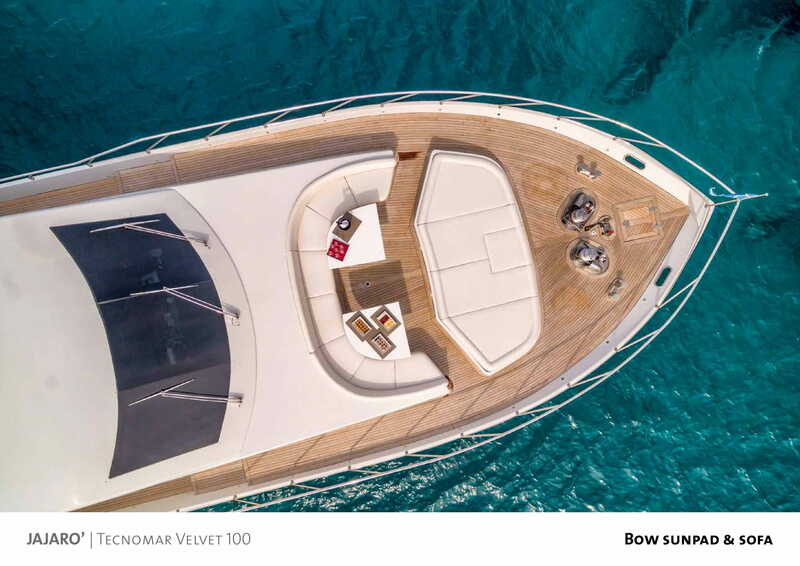 With her 31 meter-length, she offers wide outdoor spaces like a couple of sun loungers with a sofa bow and a large aft deck with dining table. 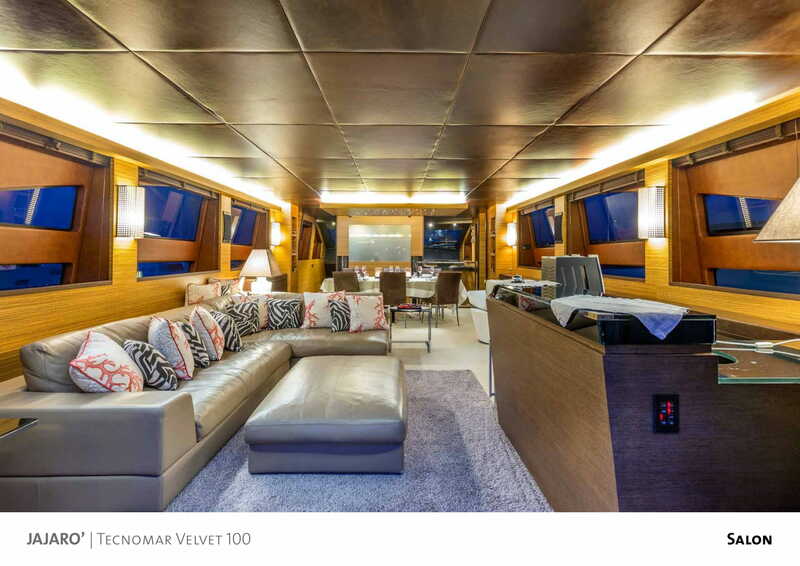 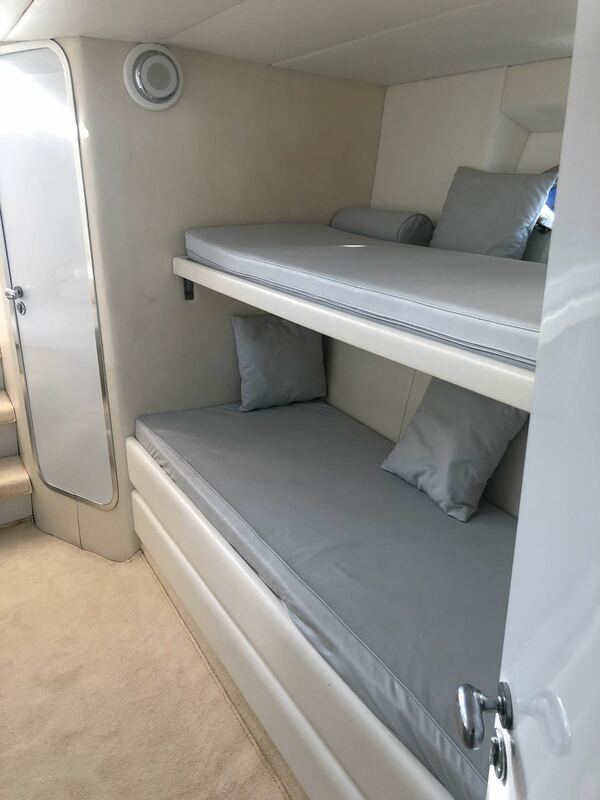 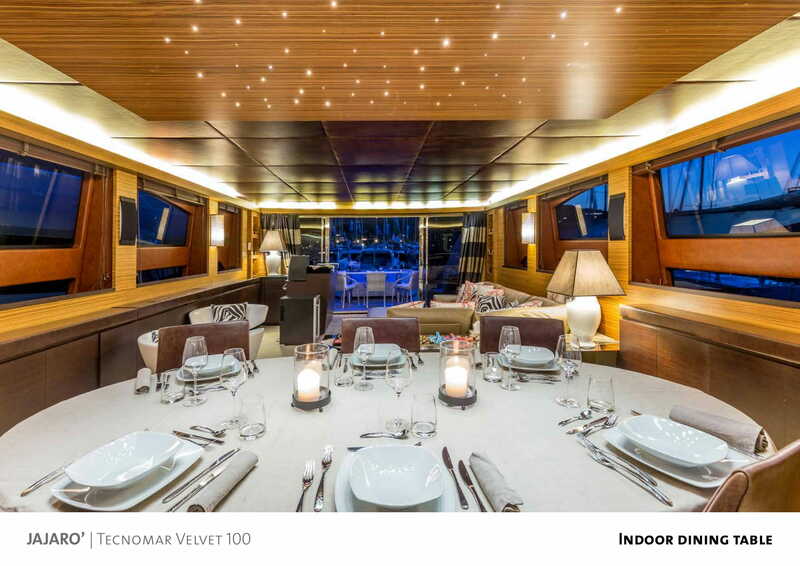 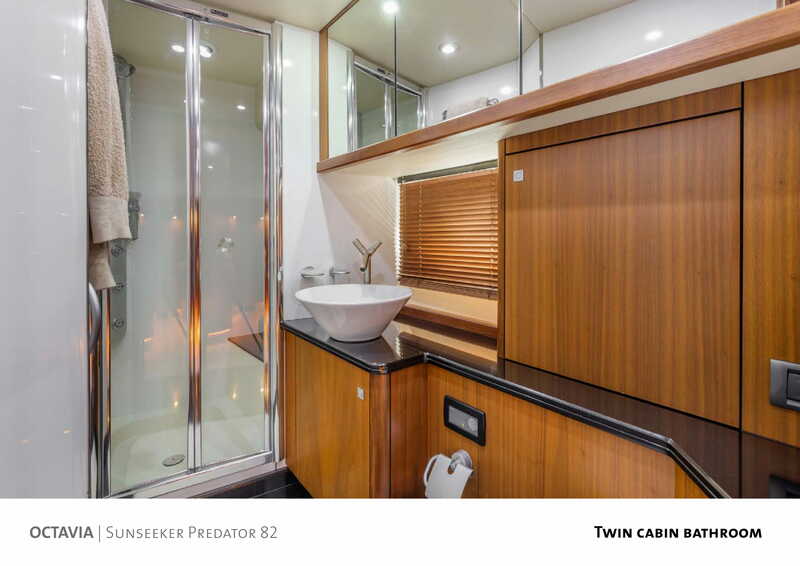 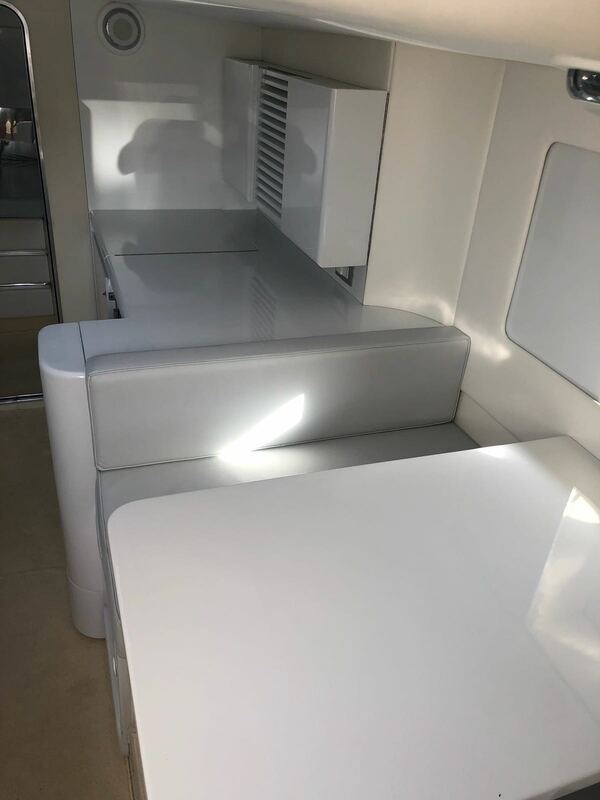 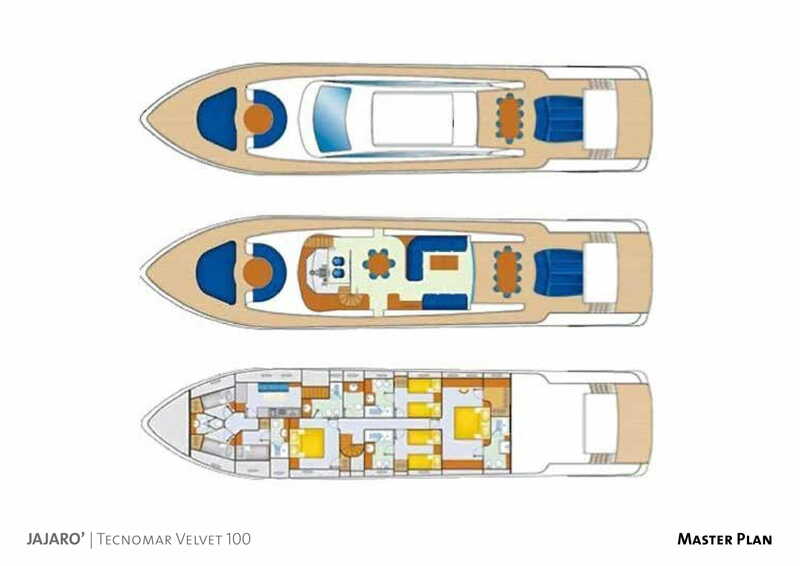 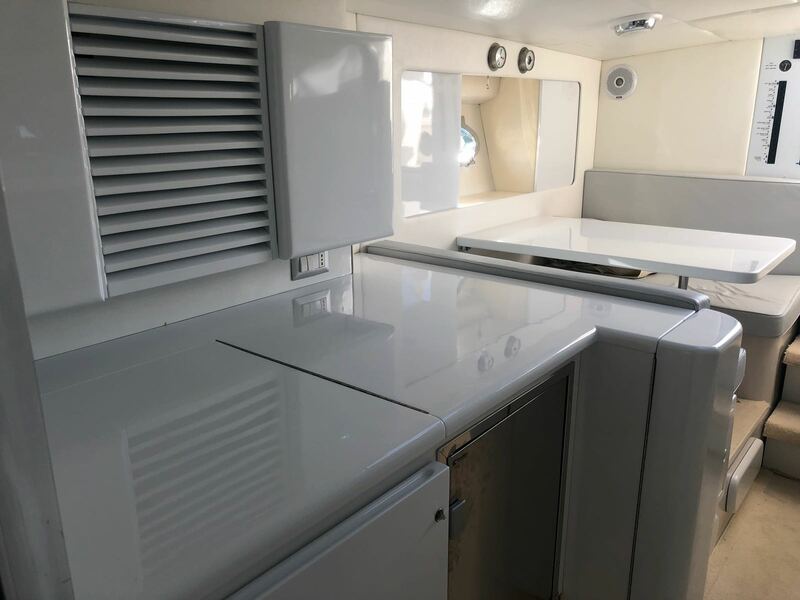 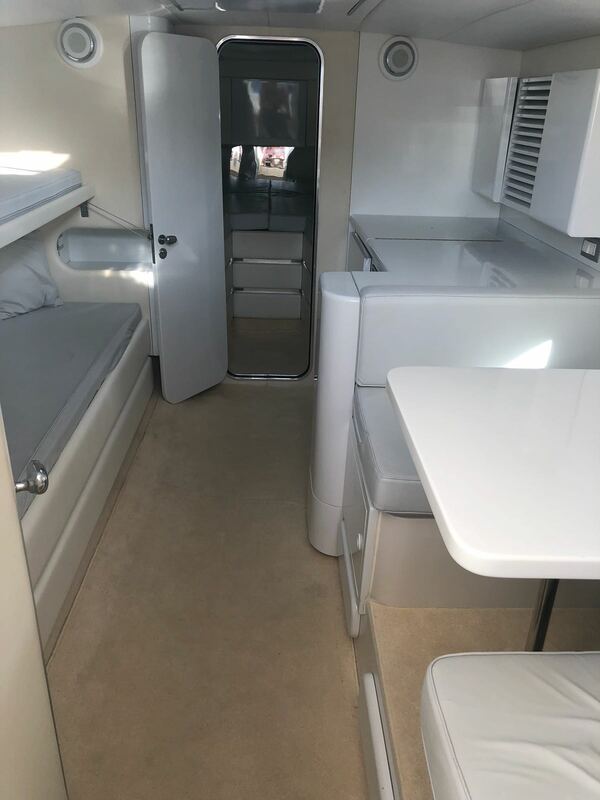 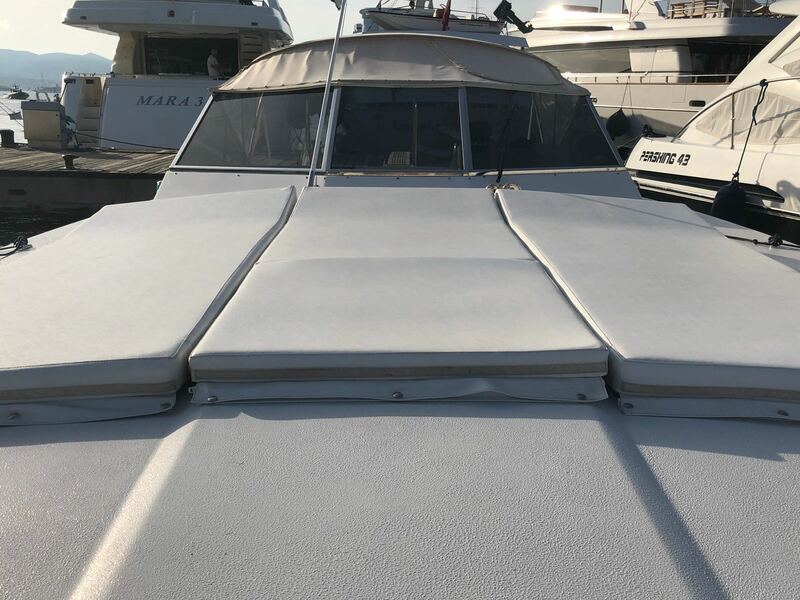 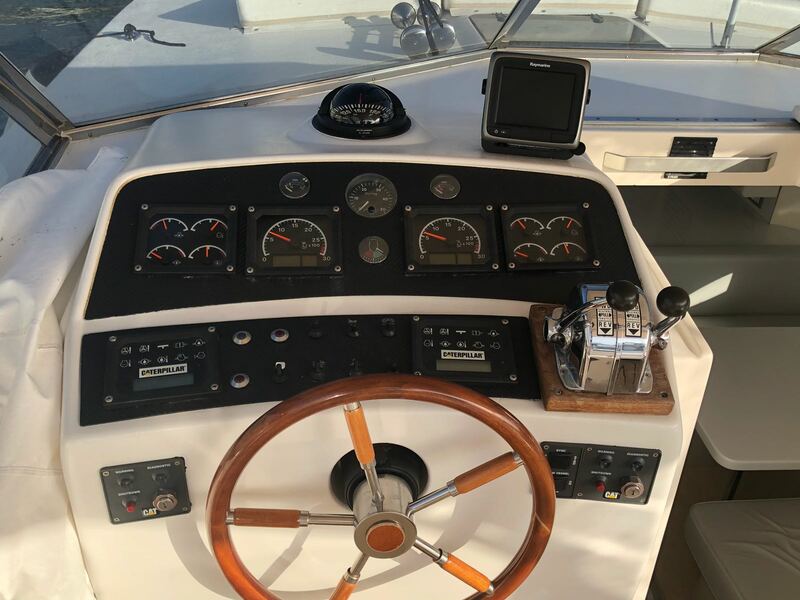 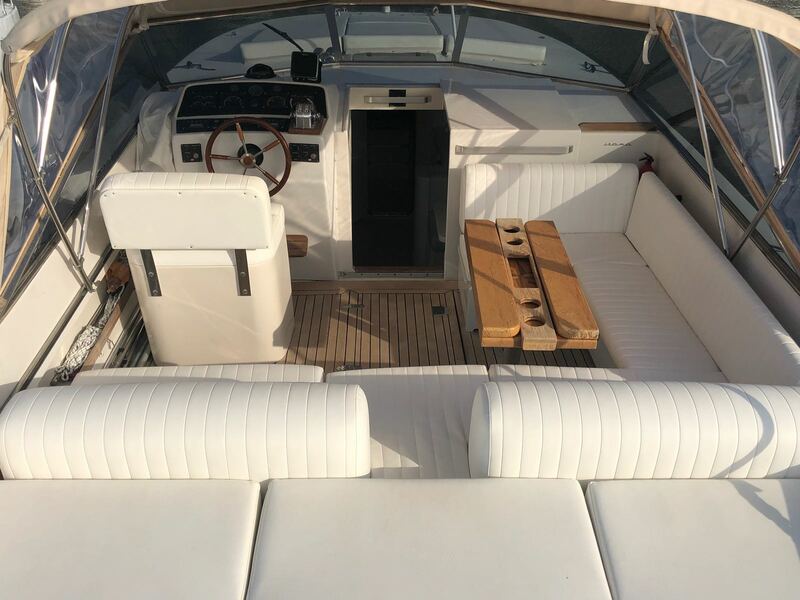 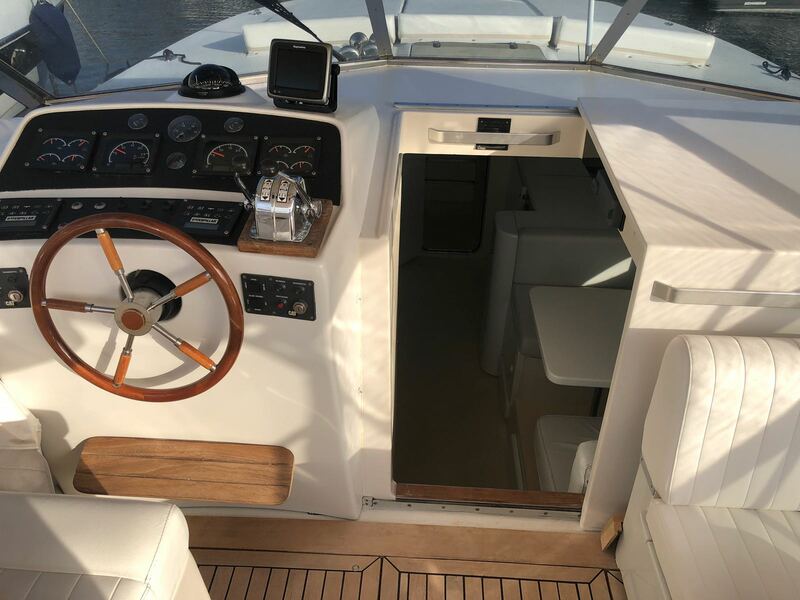 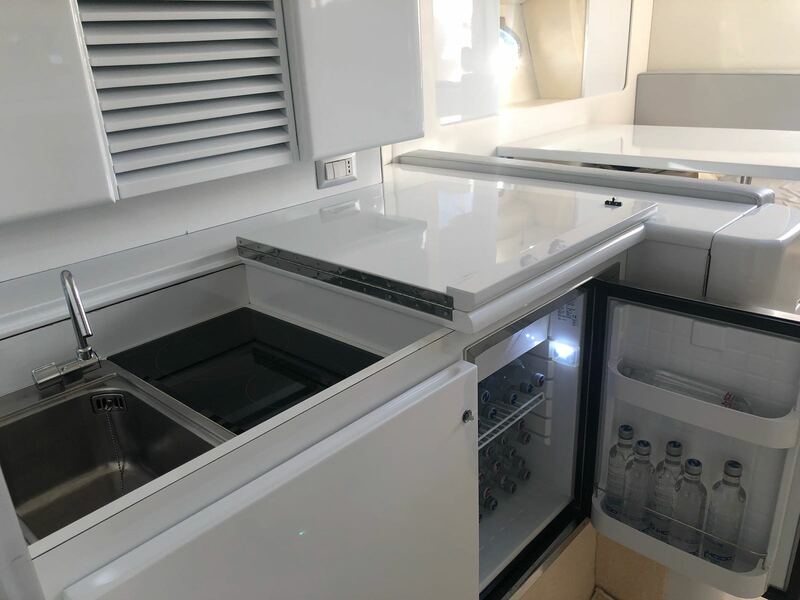 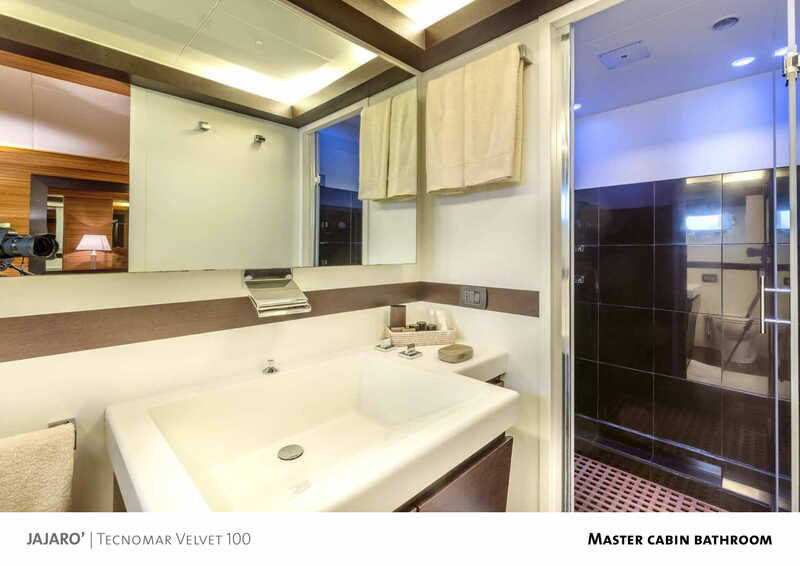 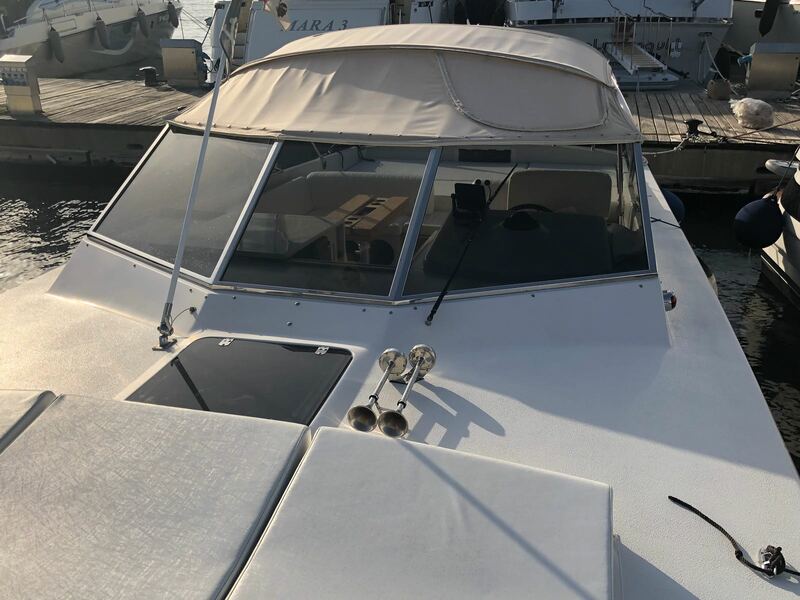 Cabins on the yacht are 4: a stateroom located aft, full beam with walk-in closet and ensuite bathroom; a VIP cabin located bow, also with cabin clo- set and bathroom; two cabins with twin beds located in the center of the yacht, both with ensuite bathrooms. 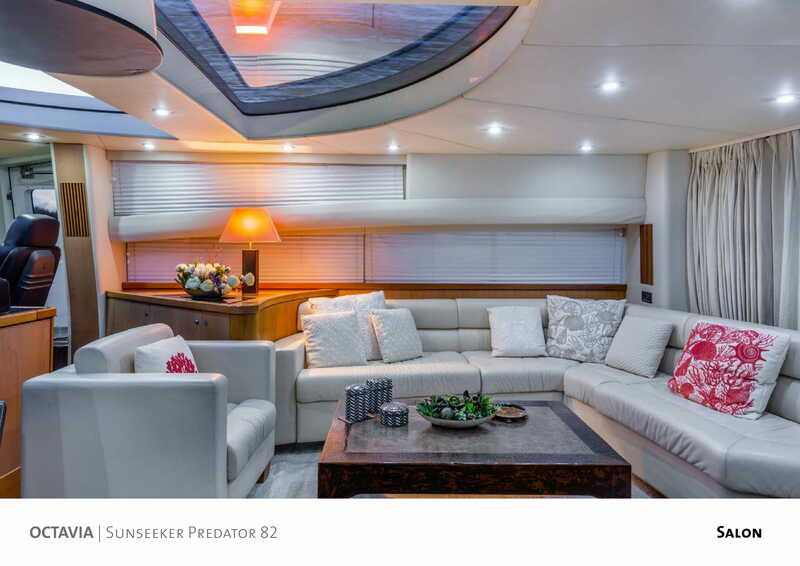 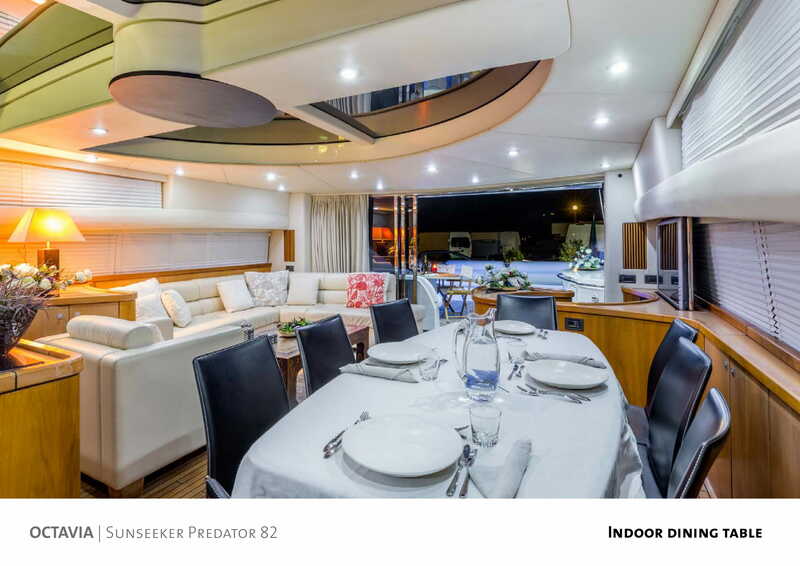 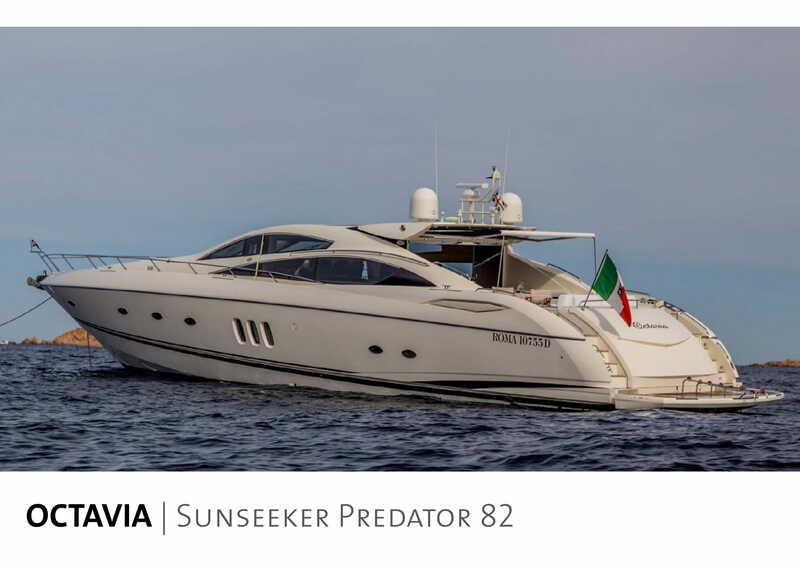 Sportiness and elegance: the Sunseeker 82 Octavia. 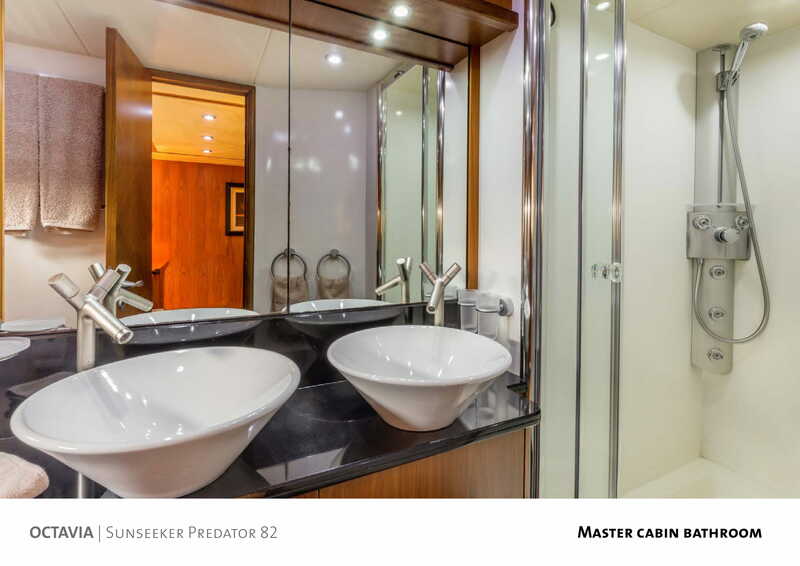 The answer to those looking environments from large breaths and attention to details. 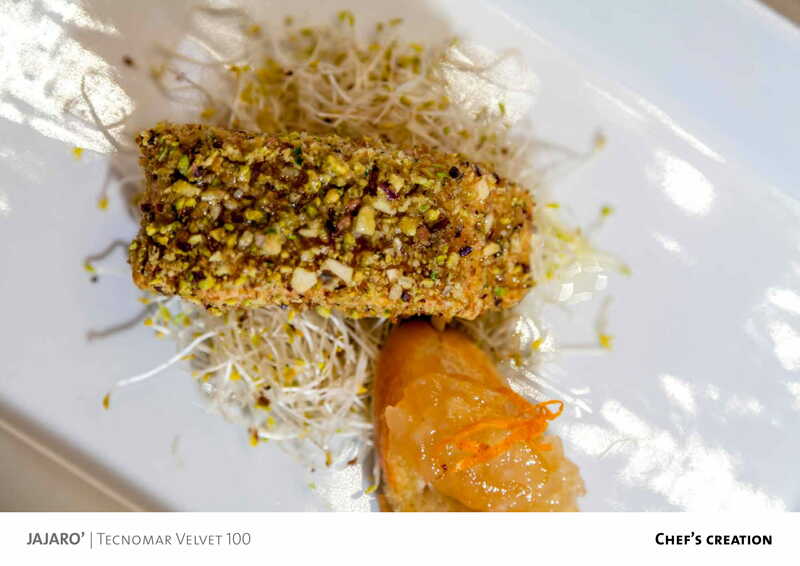 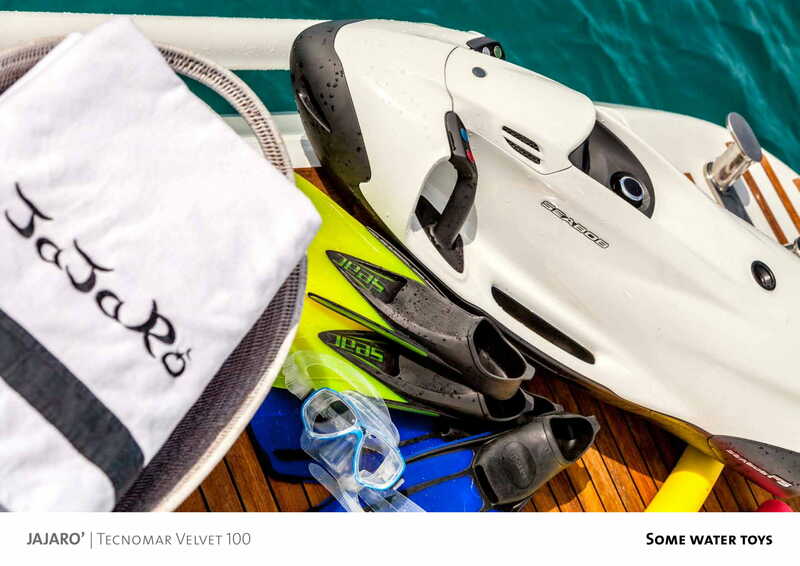 An unfor- gettable experience. 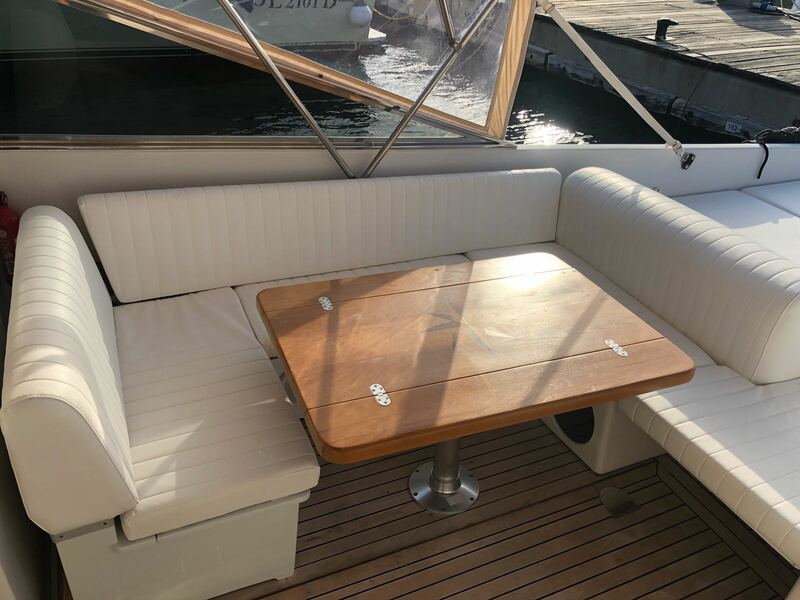 The outdoor areas are characterized by a large cockpit with folding table, two large and comfortable sofas (one that becomes a comfortable sun). 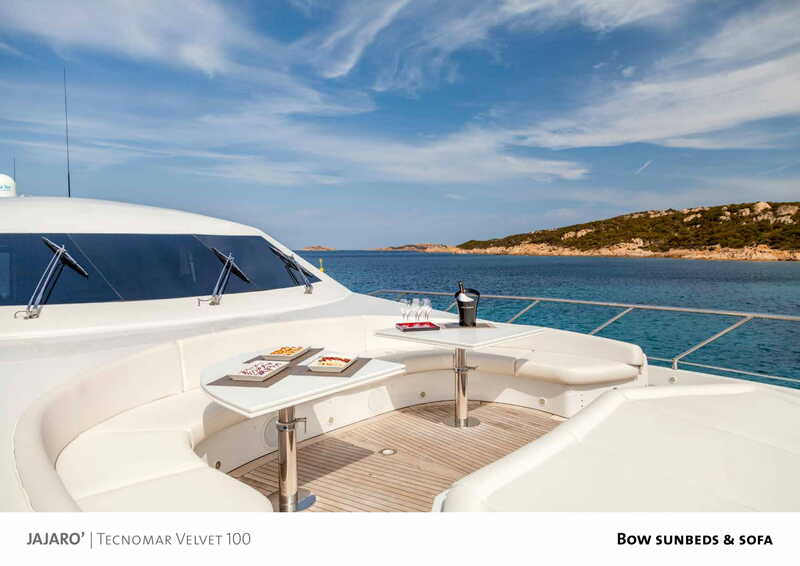 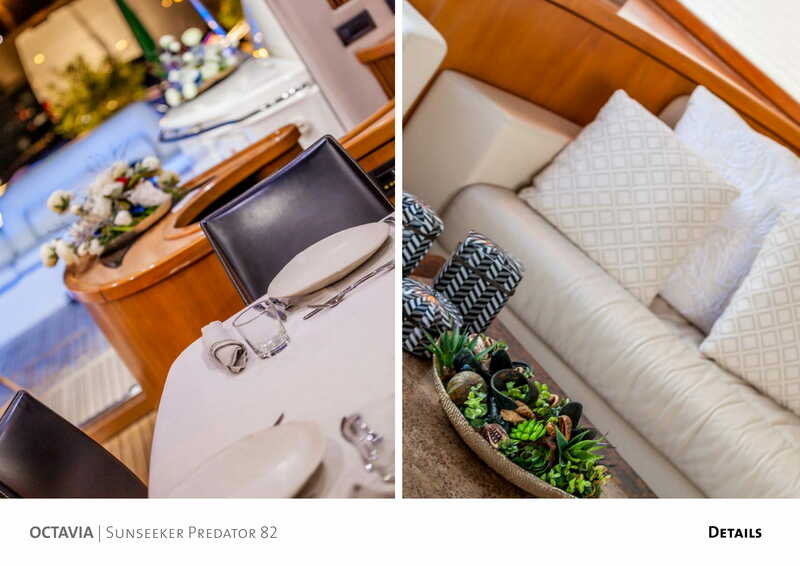 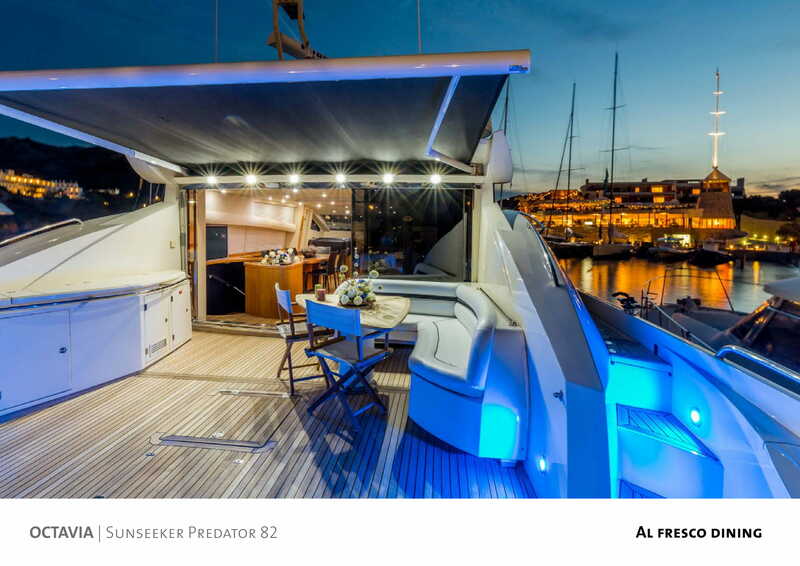 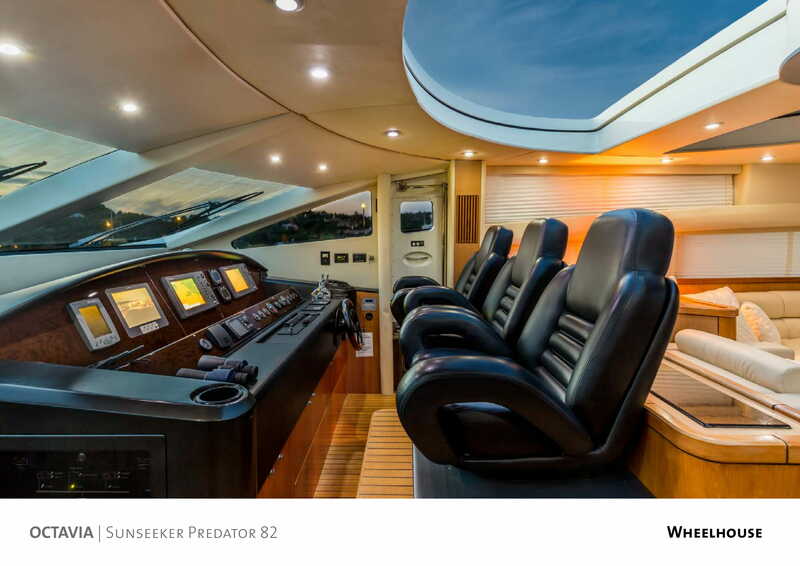 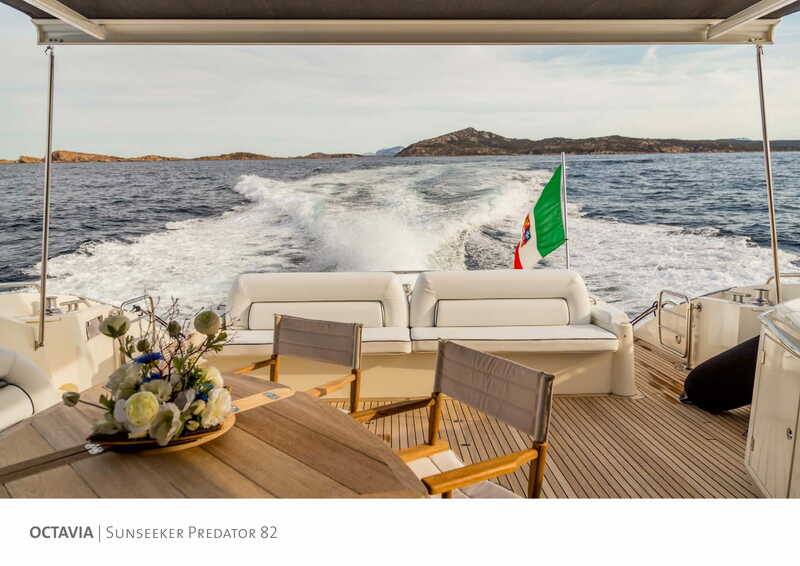 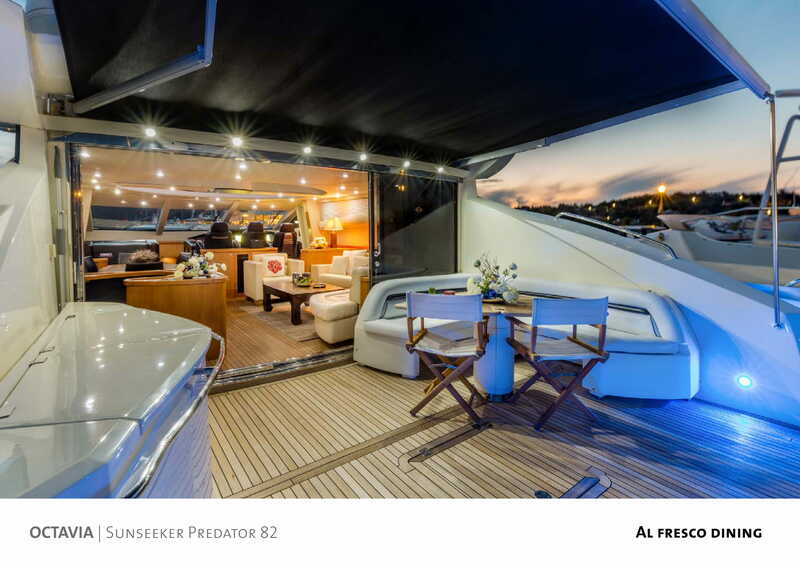 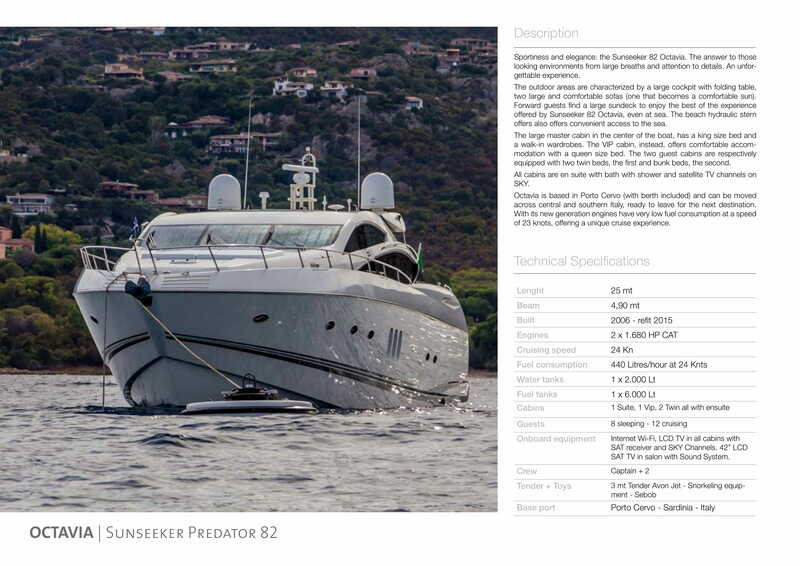 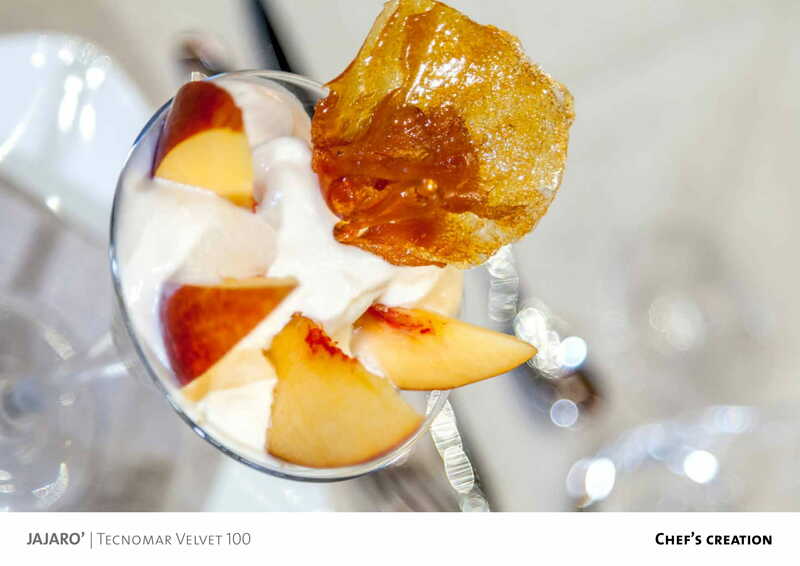 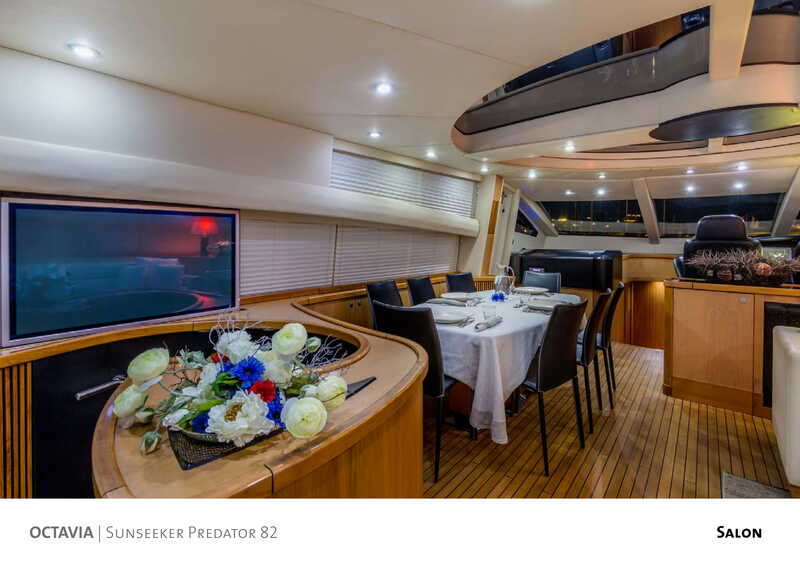 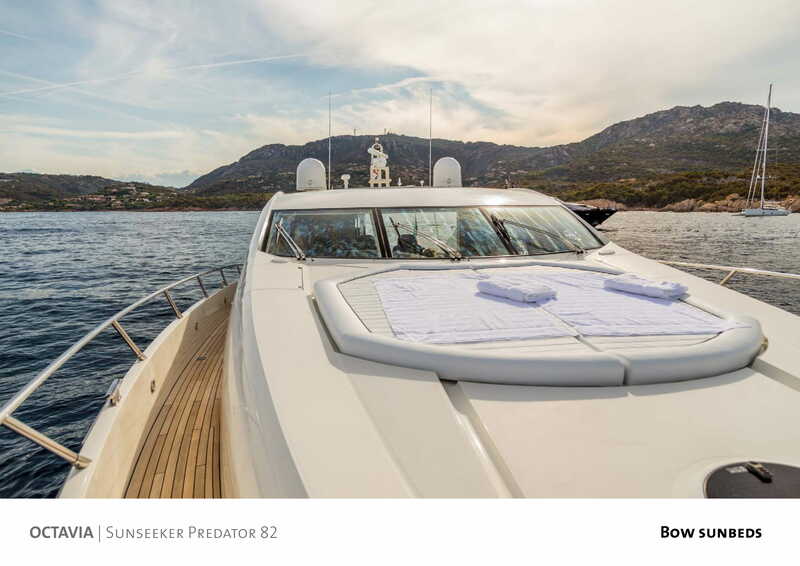 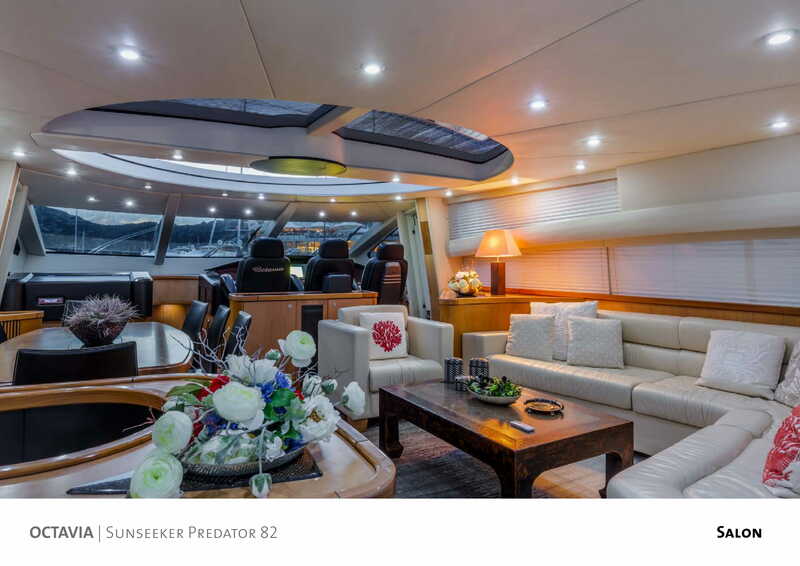 Forward guests nd a large sundeck to enjoy the best of the experience offered by Sunseeker 82 Octavia, even at sea. 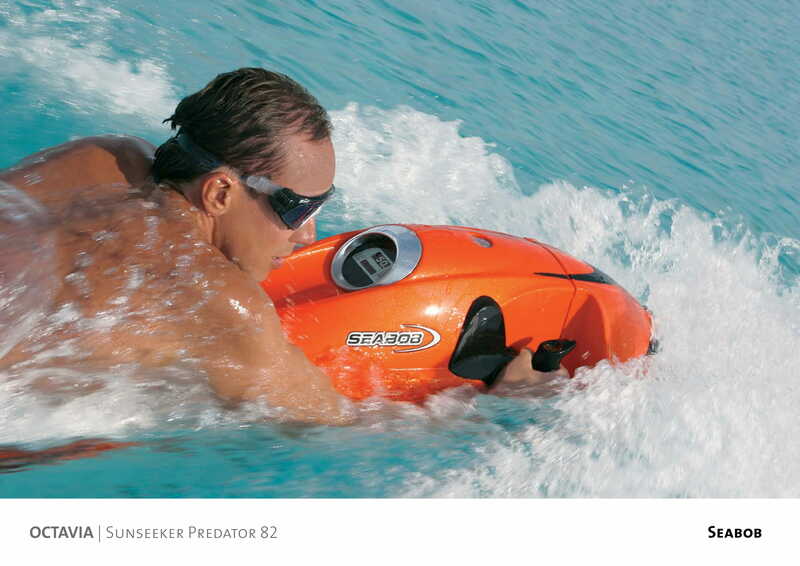 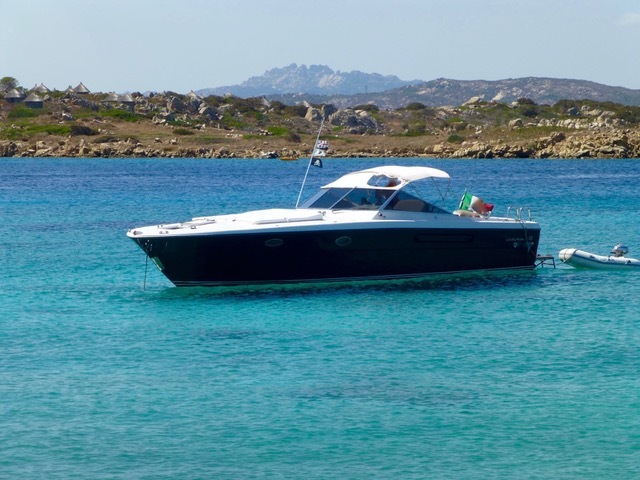 The beach hydraulic stern offers also offers convenient access to the sea. 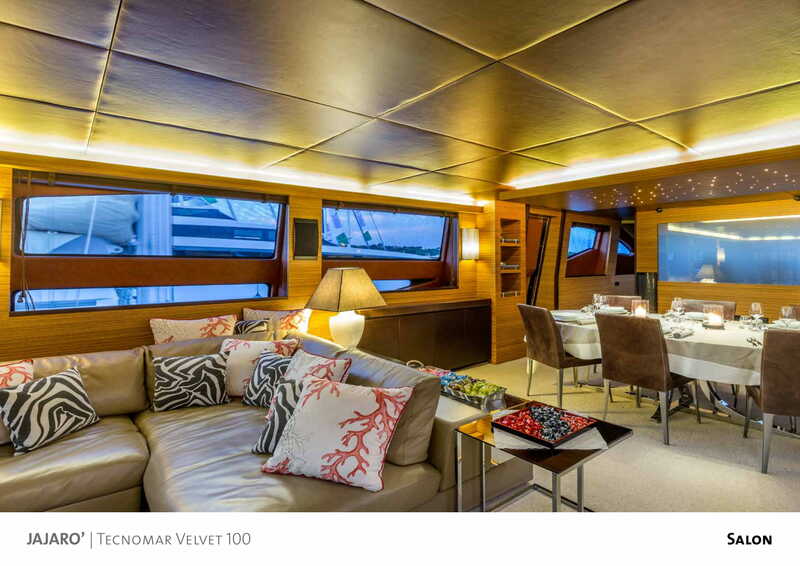 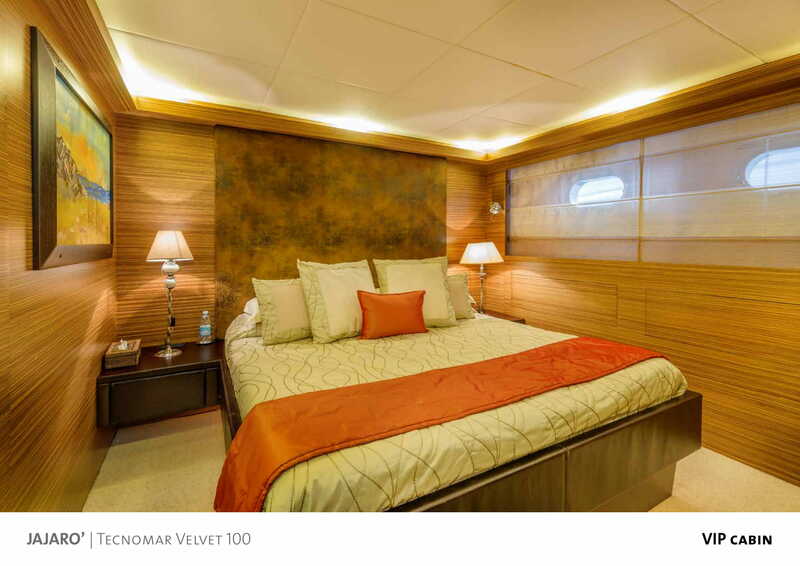 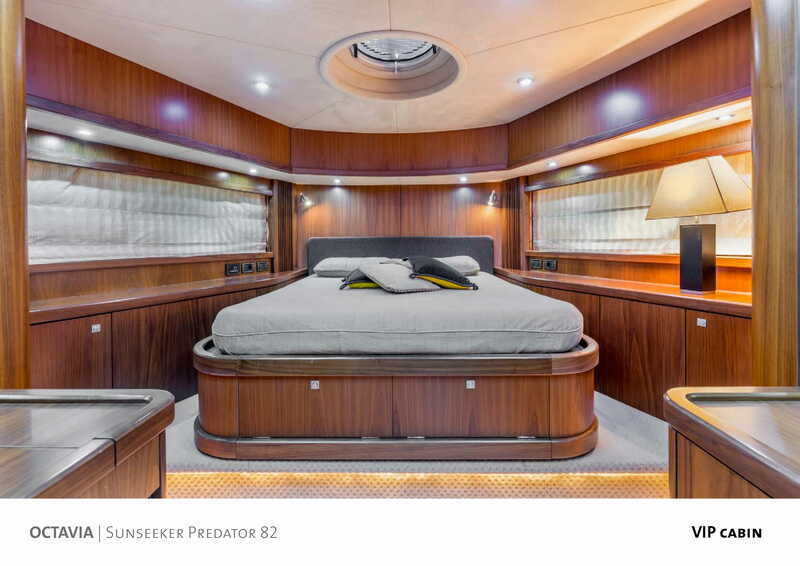 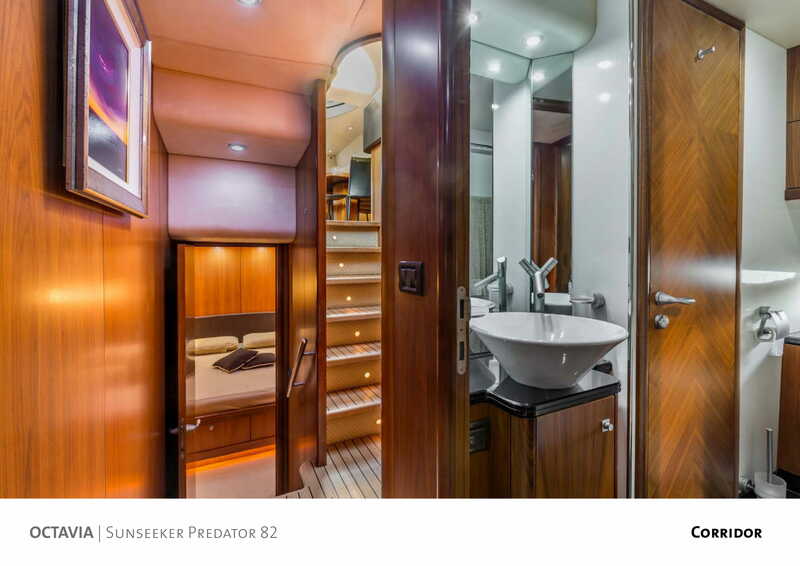 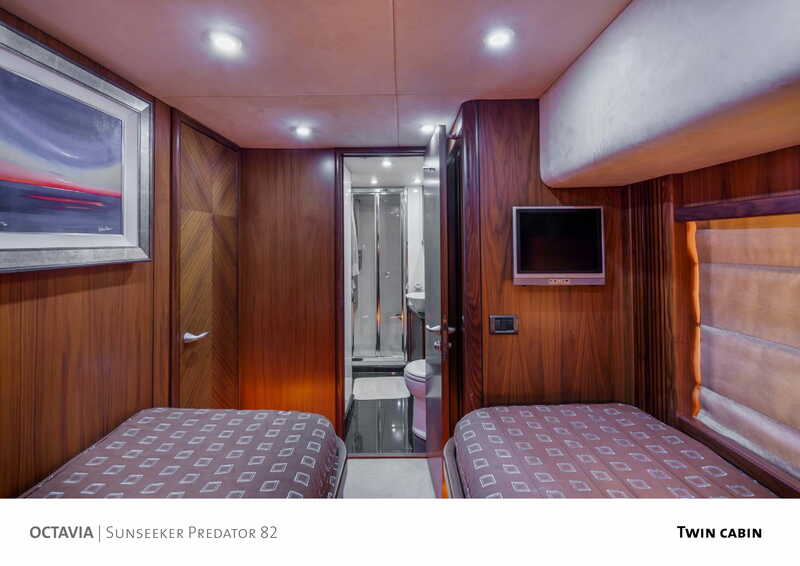 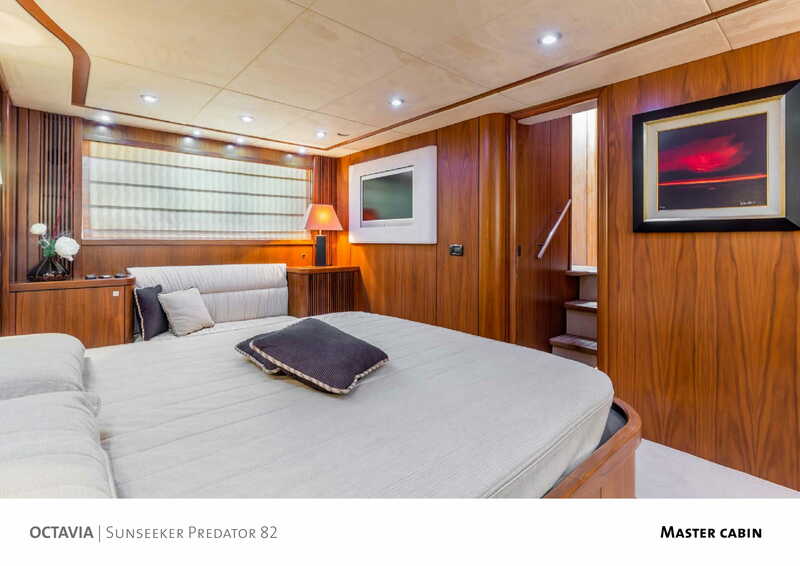 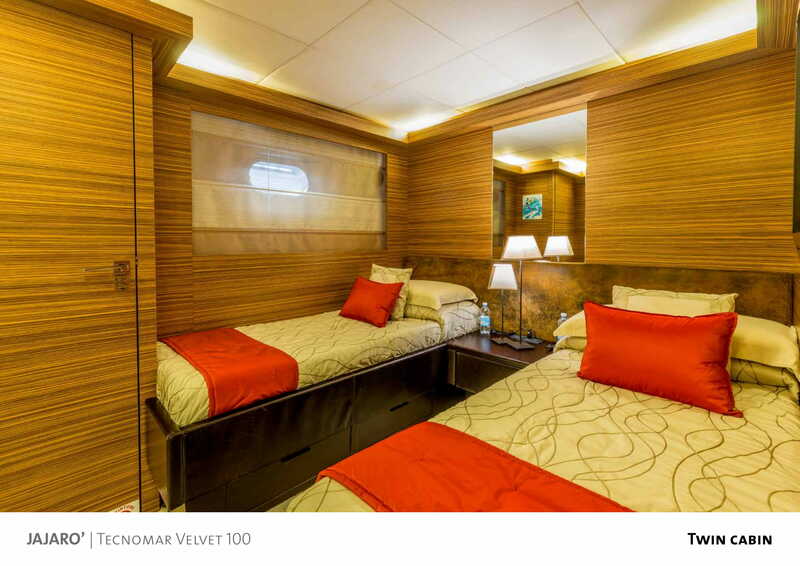 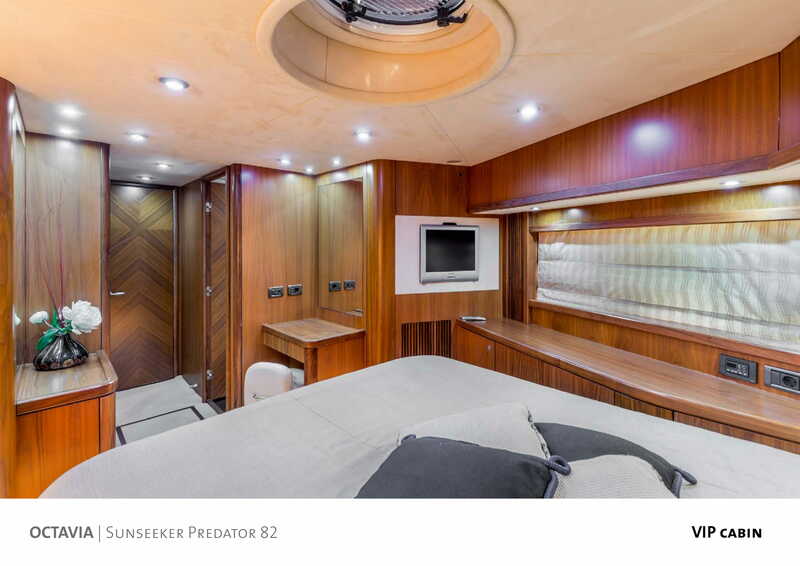 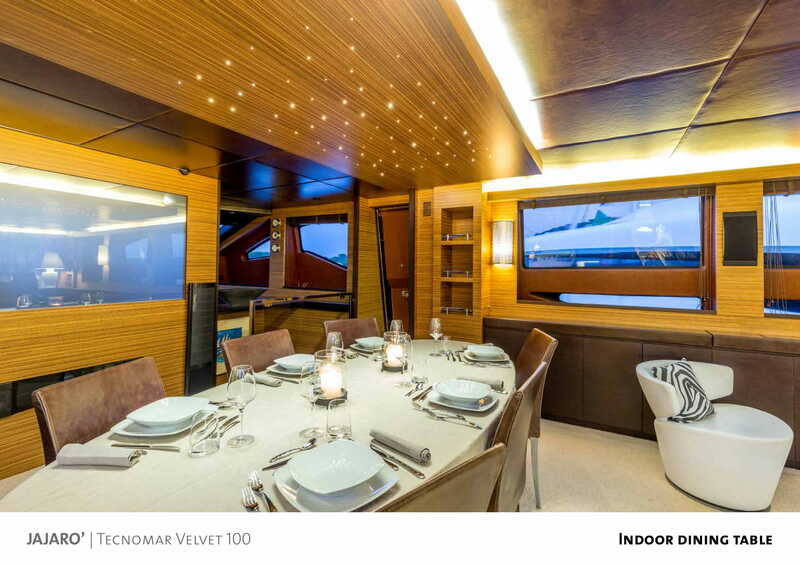 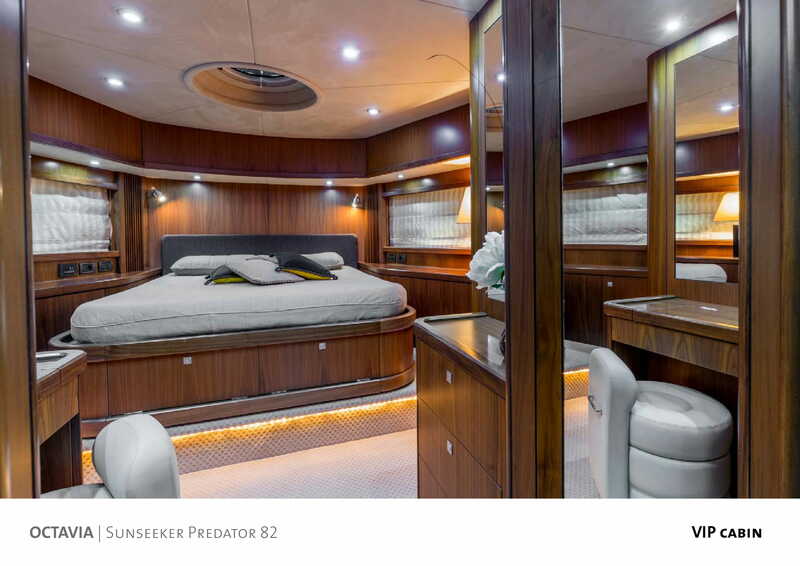 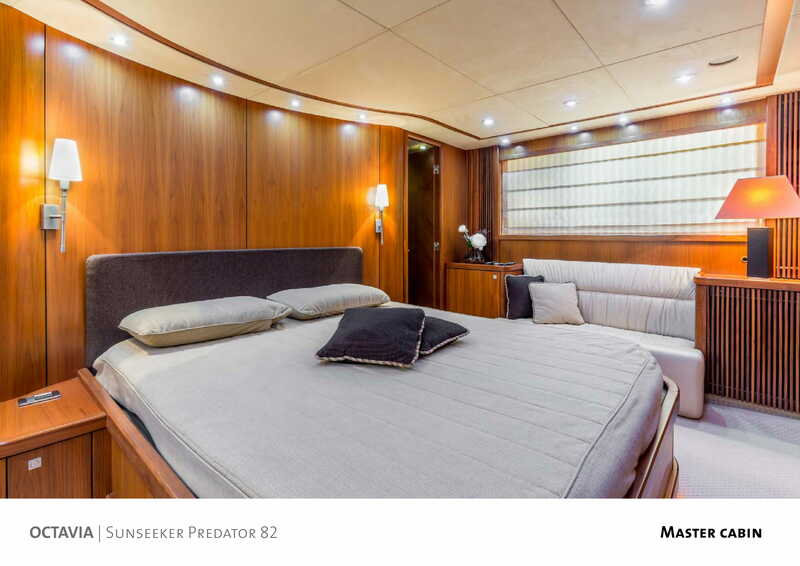 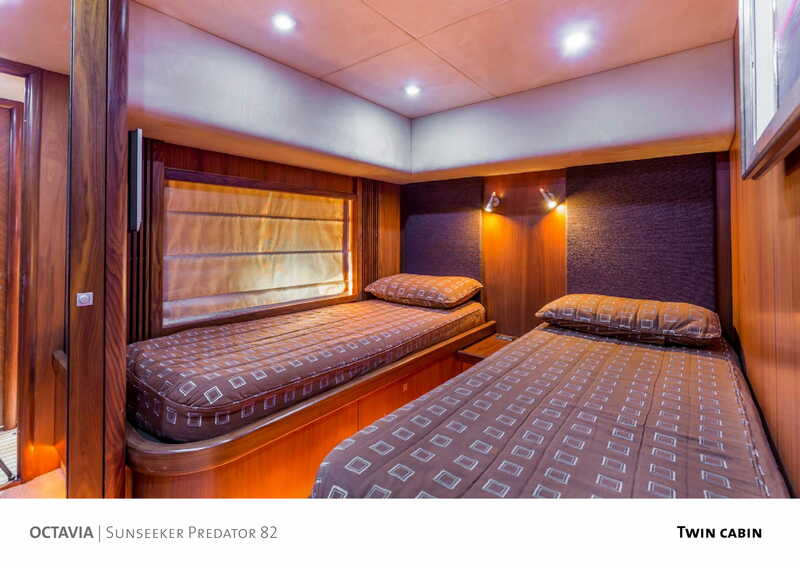 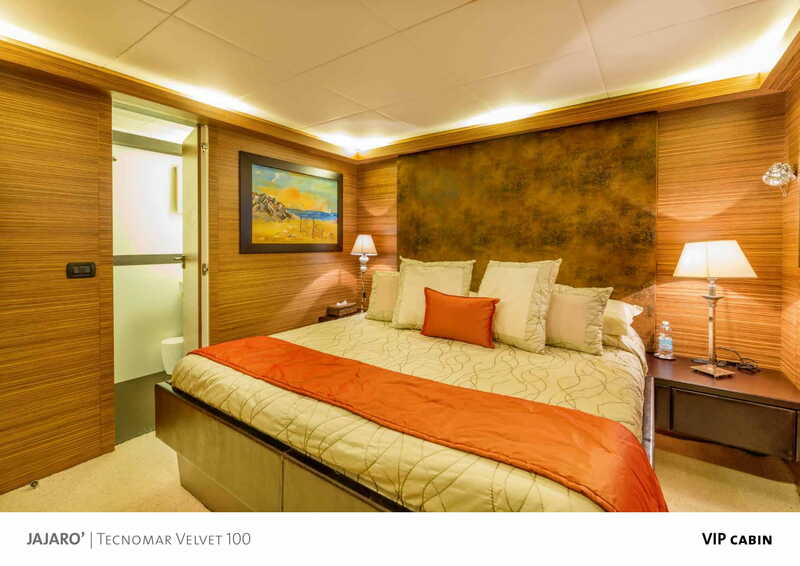 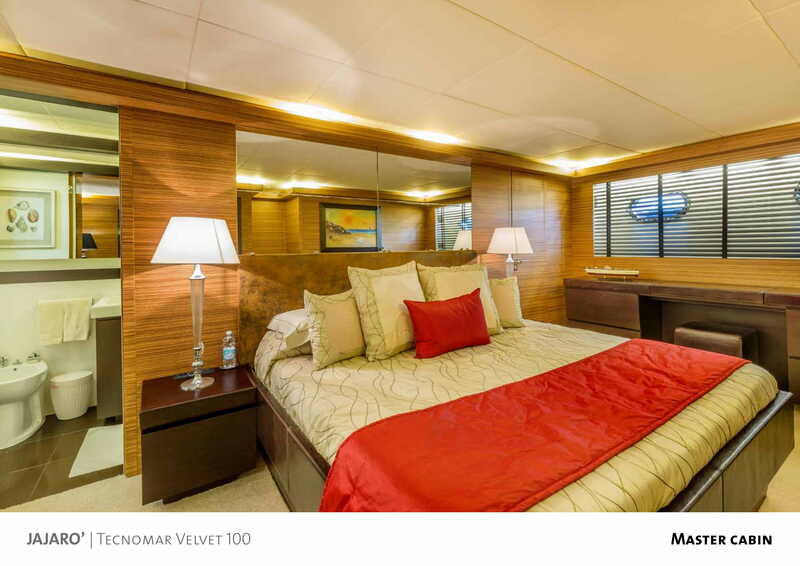 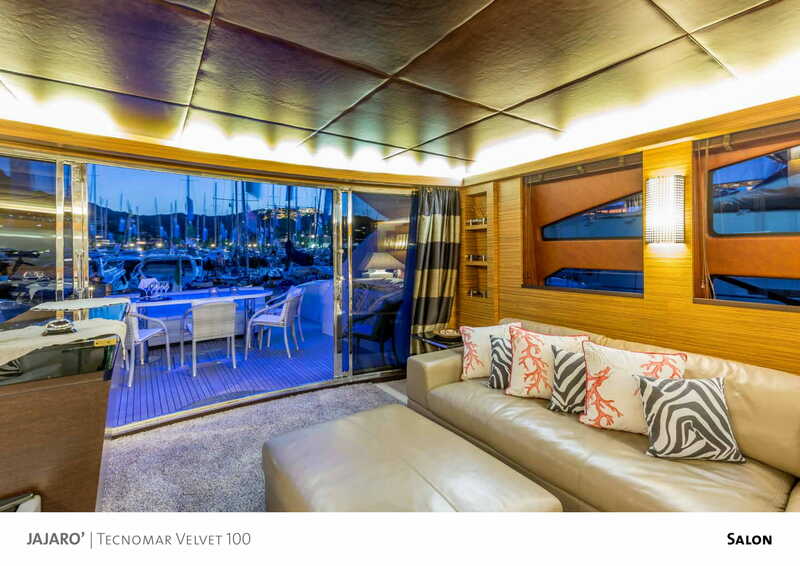 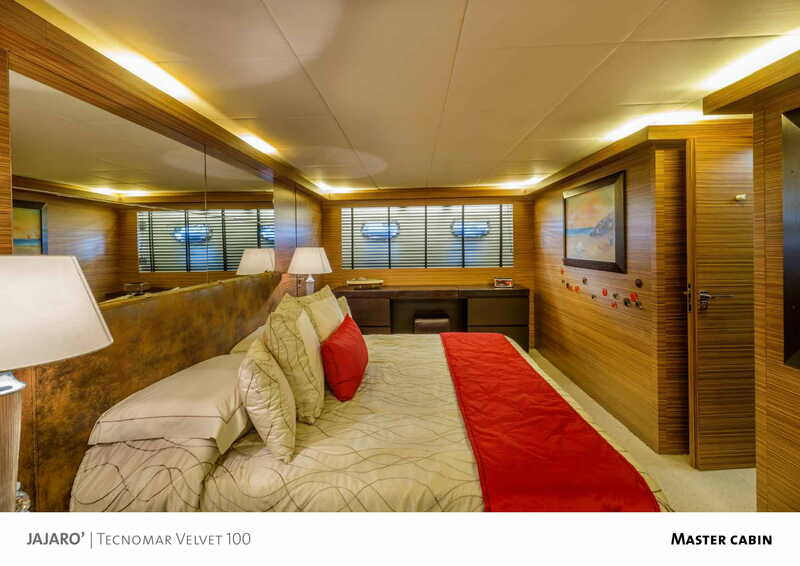 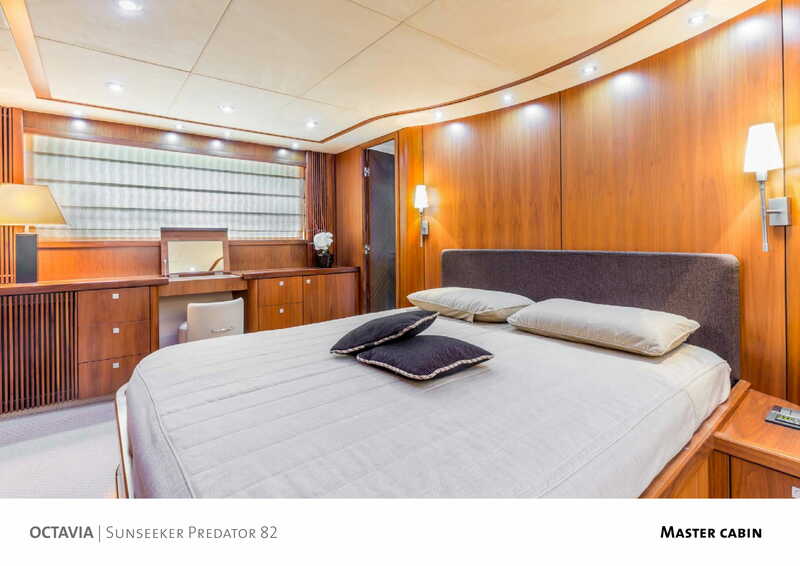 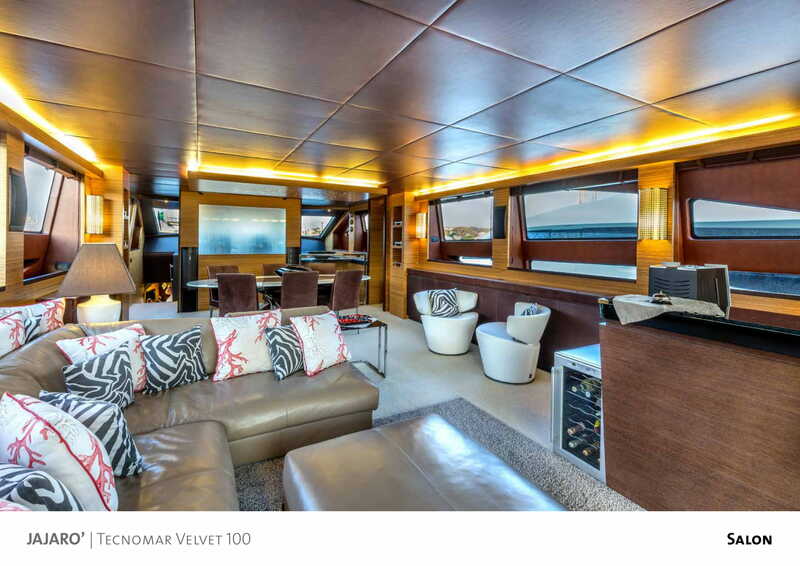 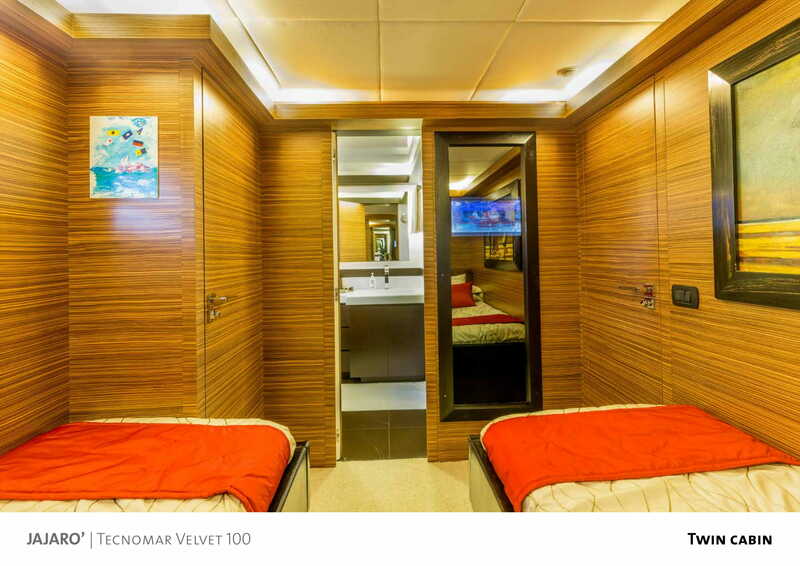 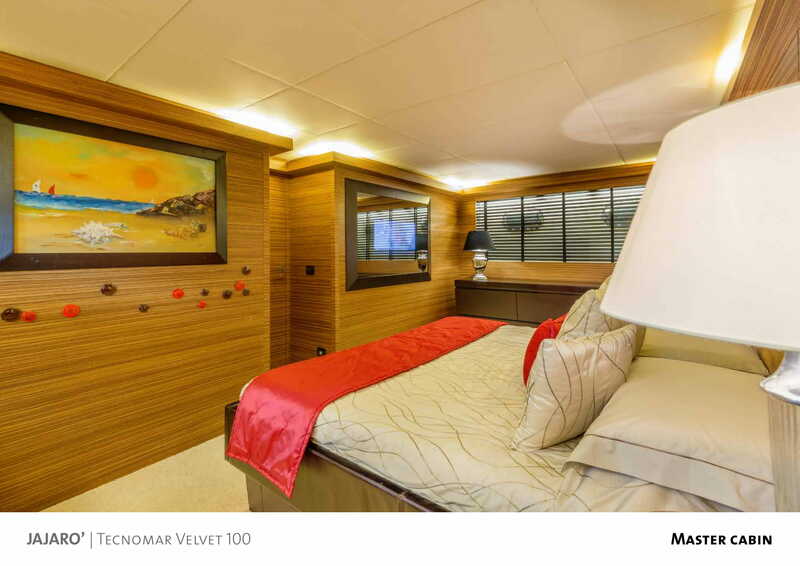 The large master cabin in the center of the boat, has a king size bed and a walk-in wardrobes. 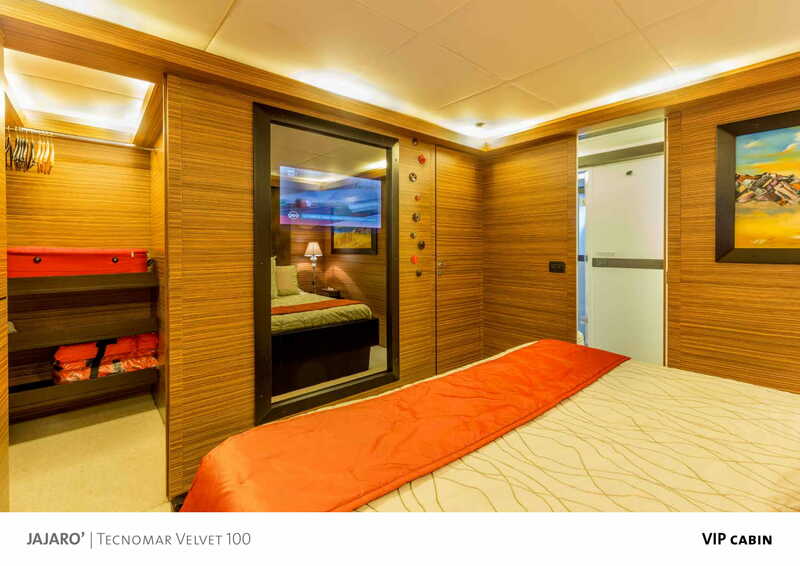 The VIP cabin, instead, offers comfortable accom- modation with a queen size bed. 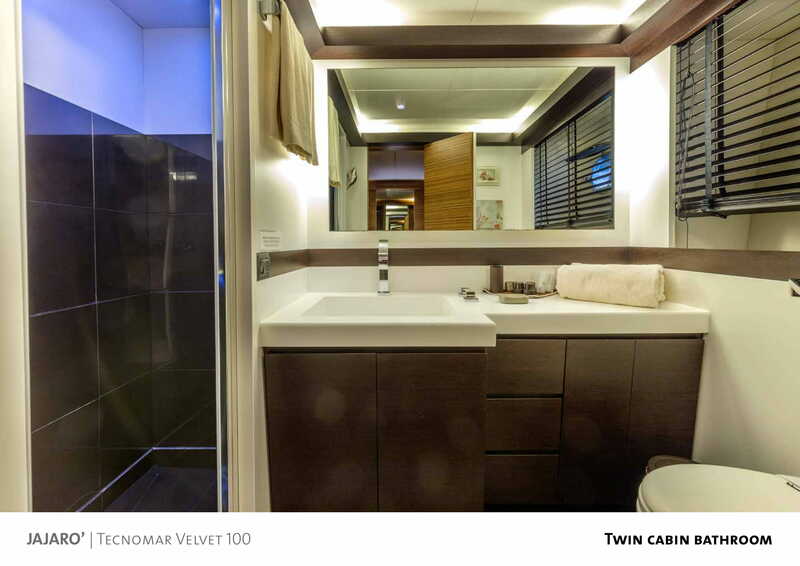 The two guest cabins are respectively equipped with two twin beds, the rst and bunk beds, the second. 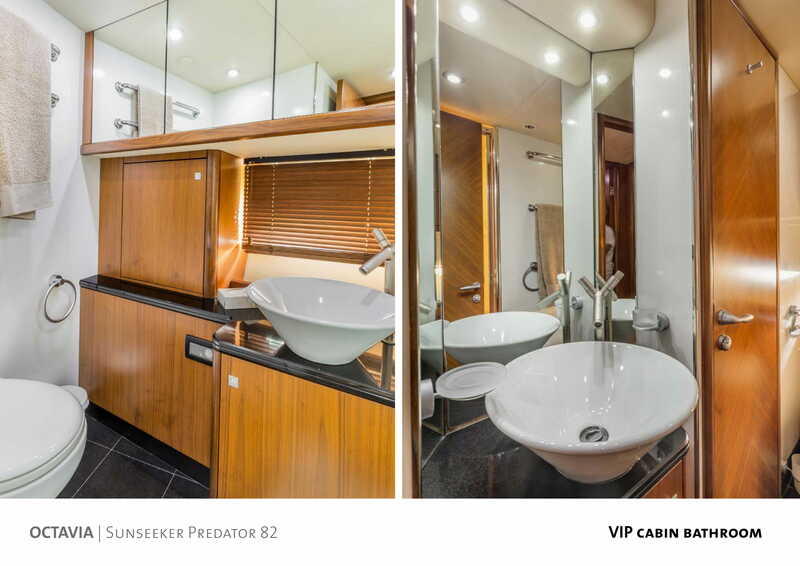 All cabins are en suite with bath with shower and satellite TV channels on SKY. 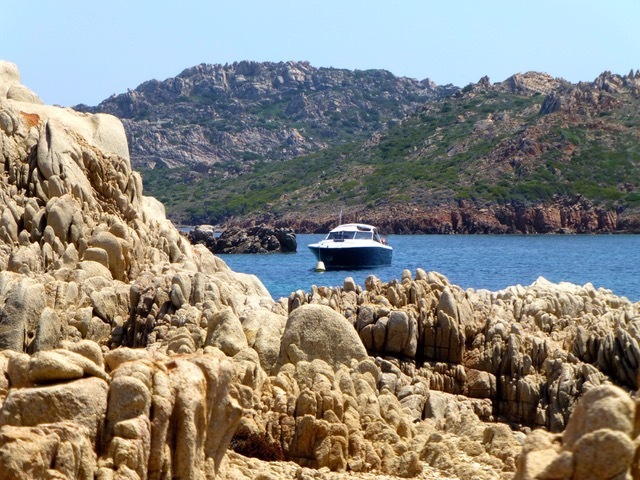 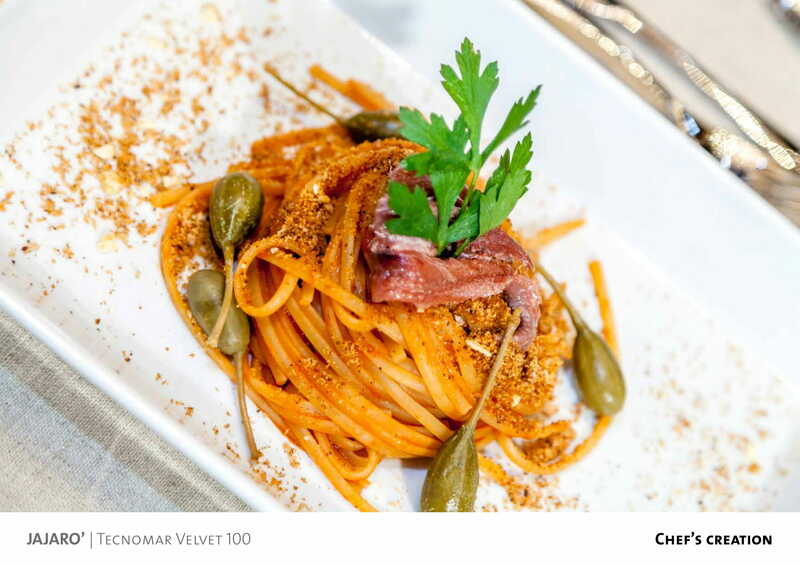 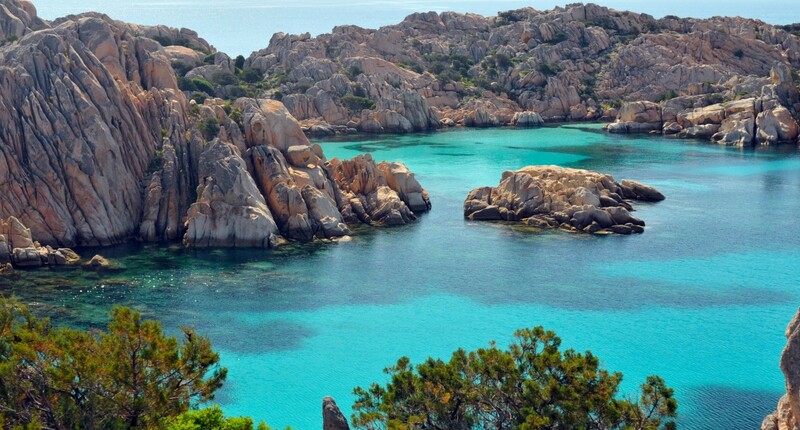 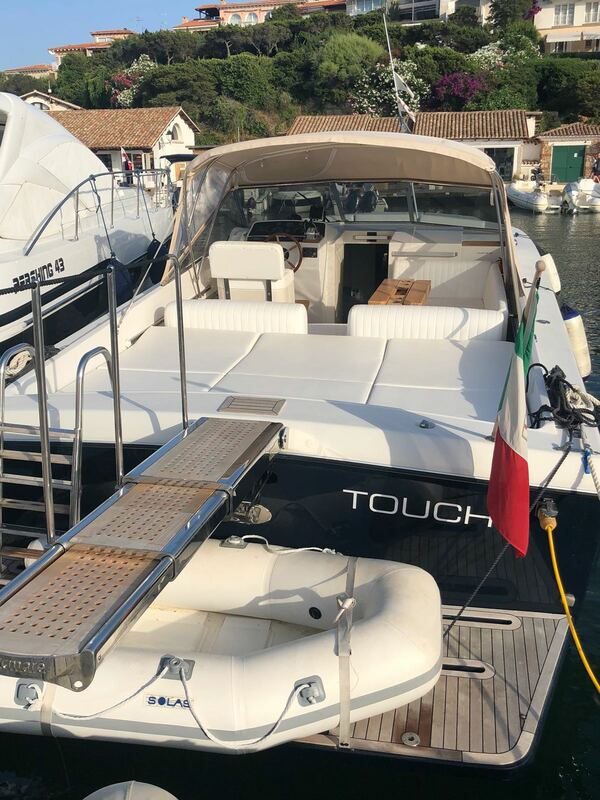 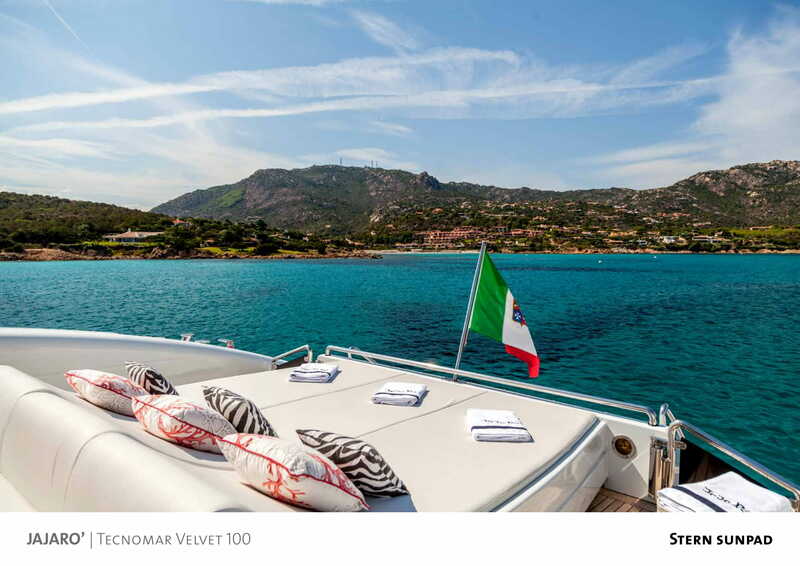 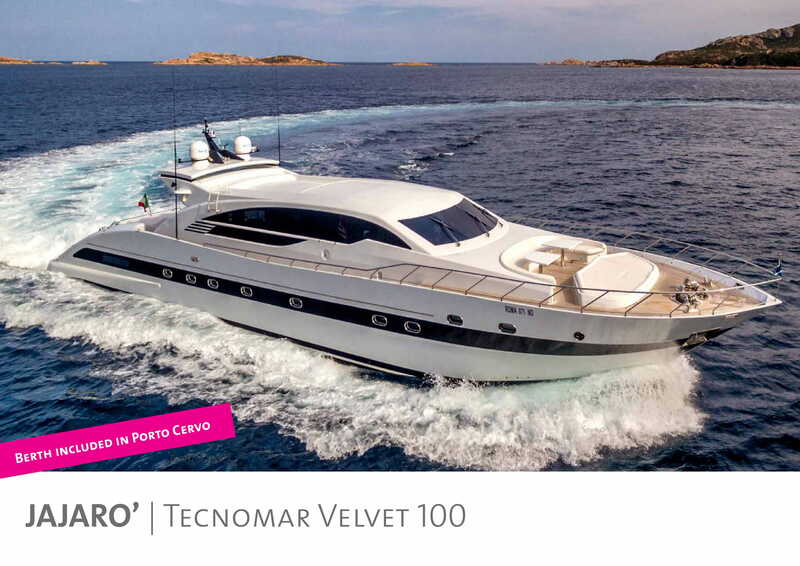 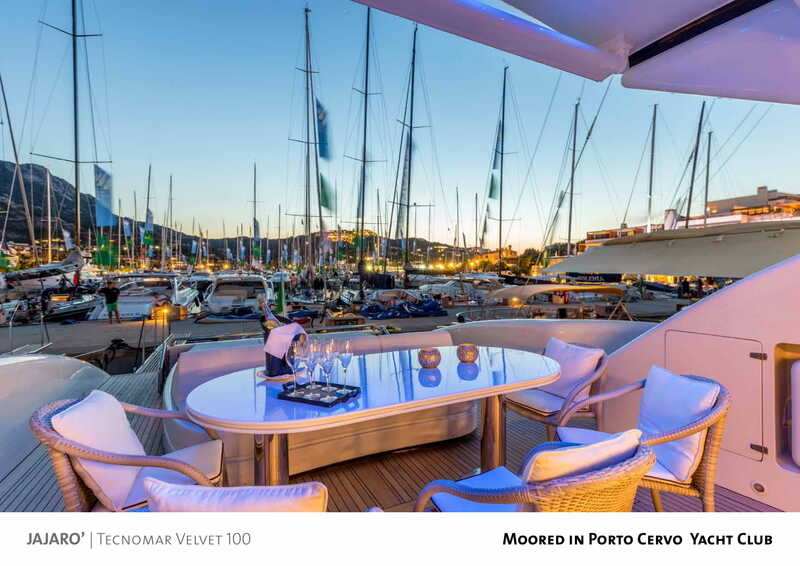 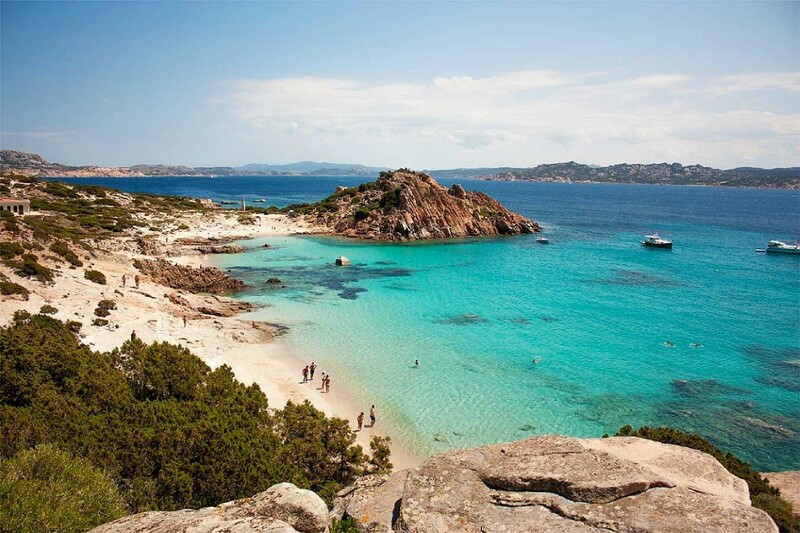 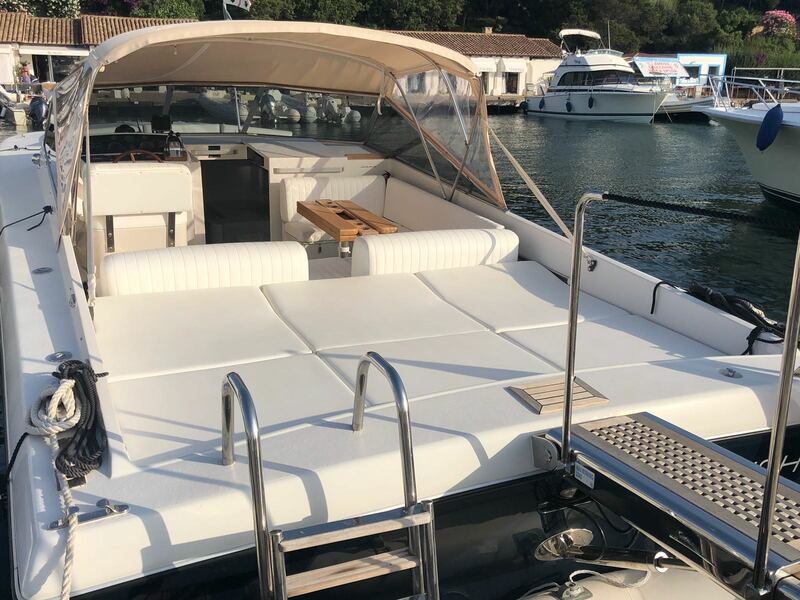 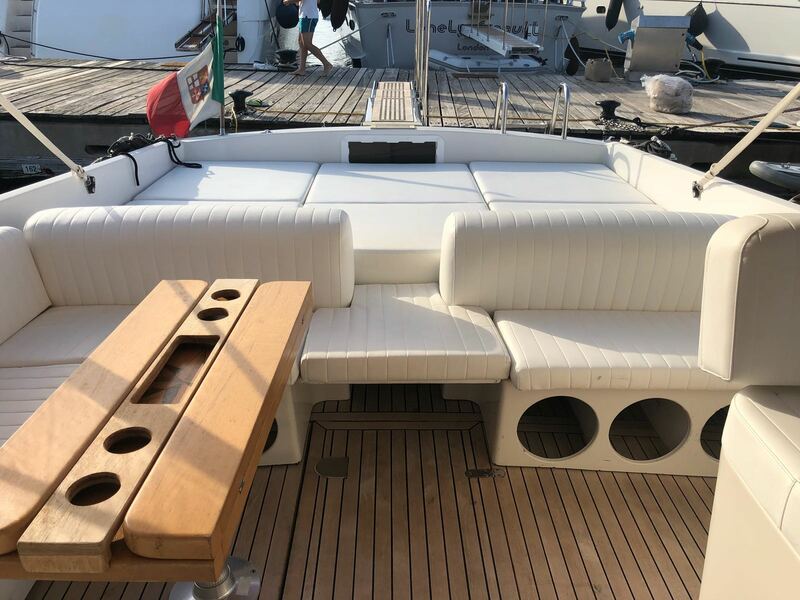 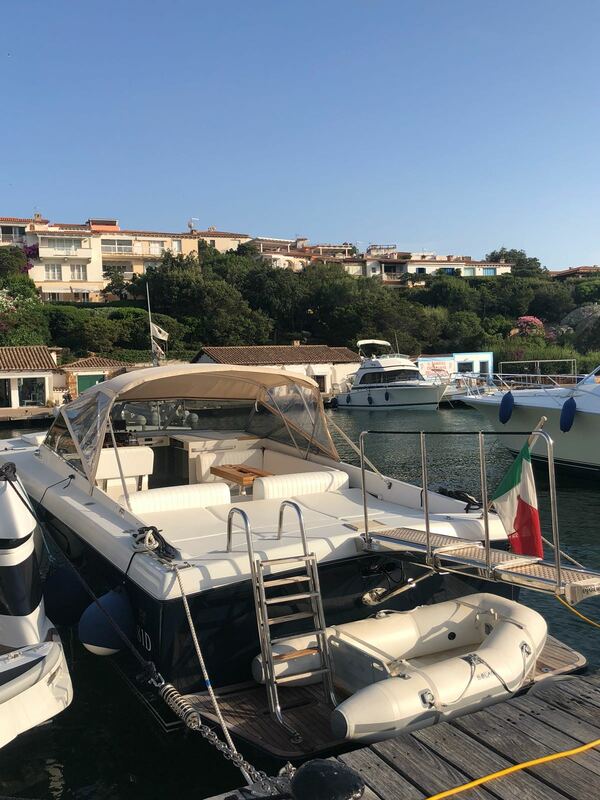 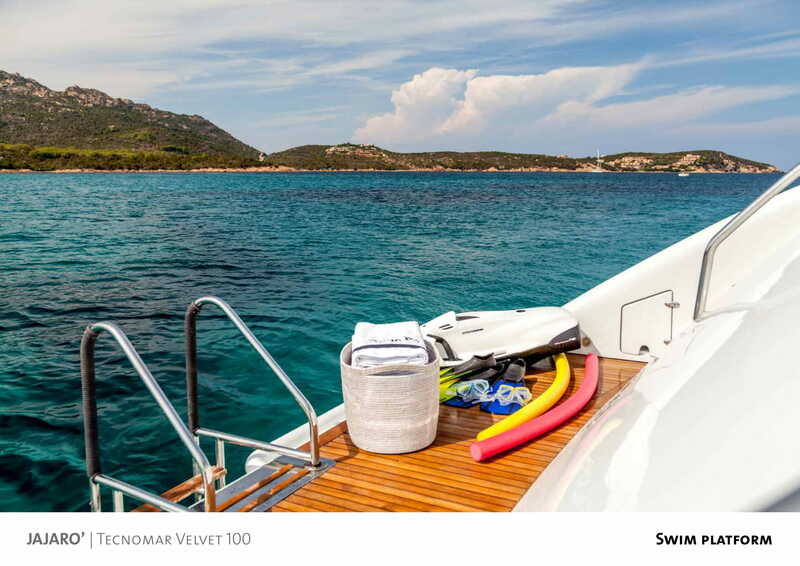 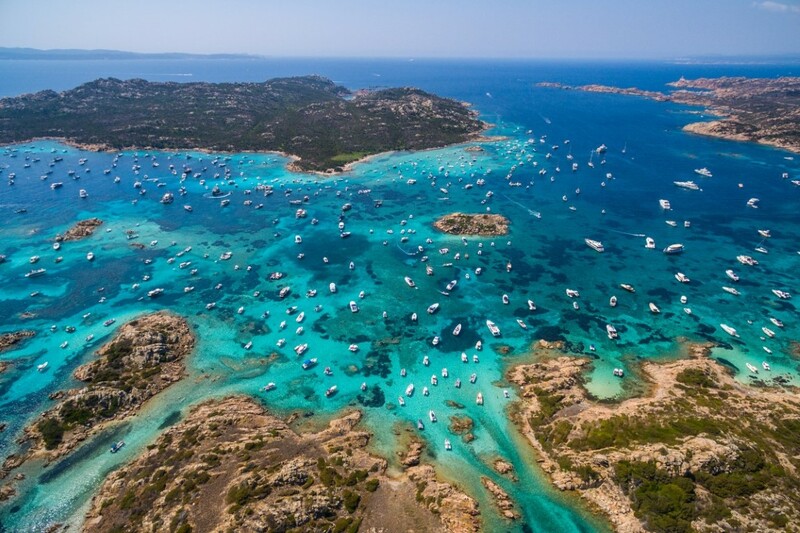 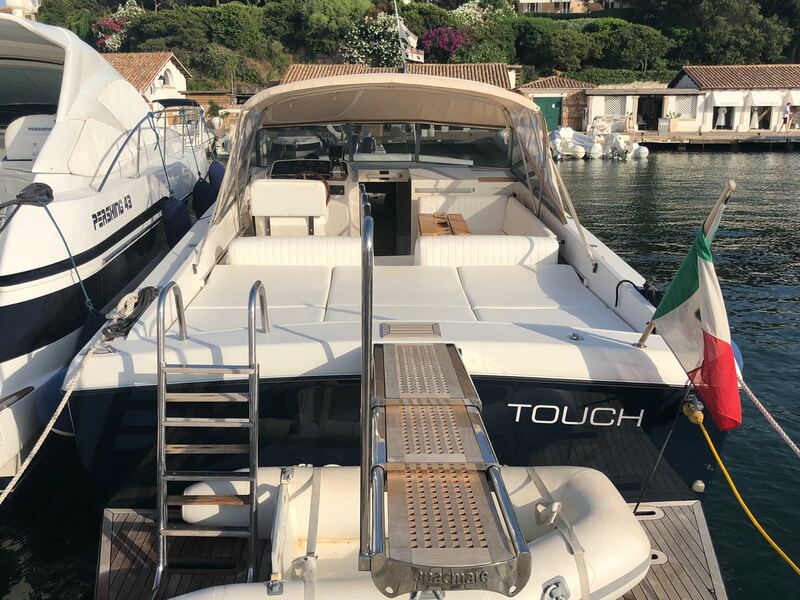 Octavia is based in Porto Cervo (with berth included) and can be moved across central and southern Italy, ready to leave for the next destination. 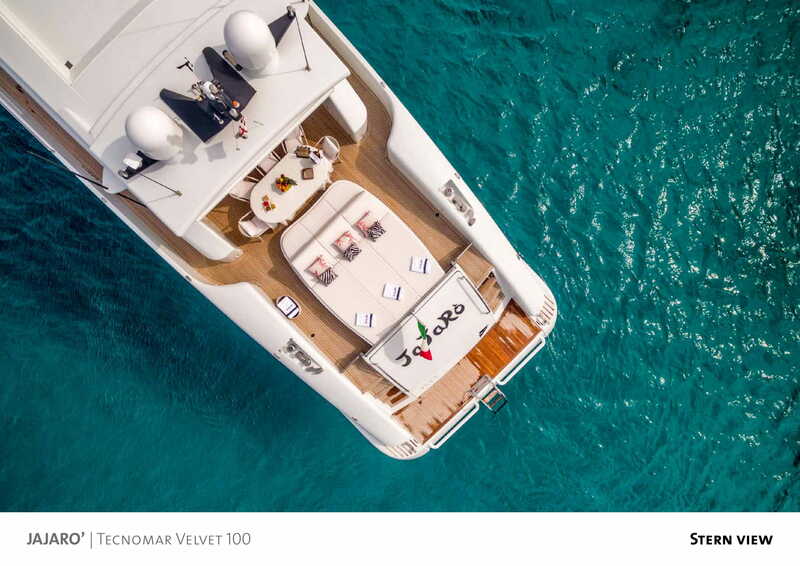 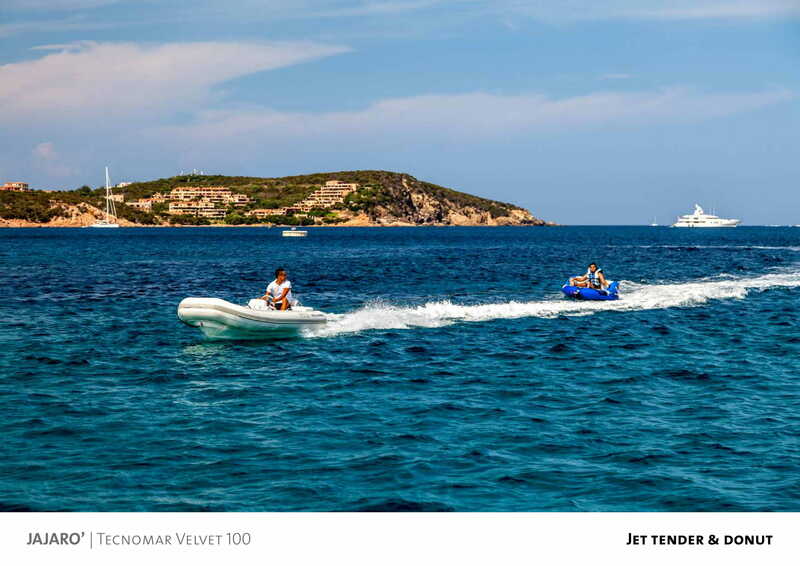 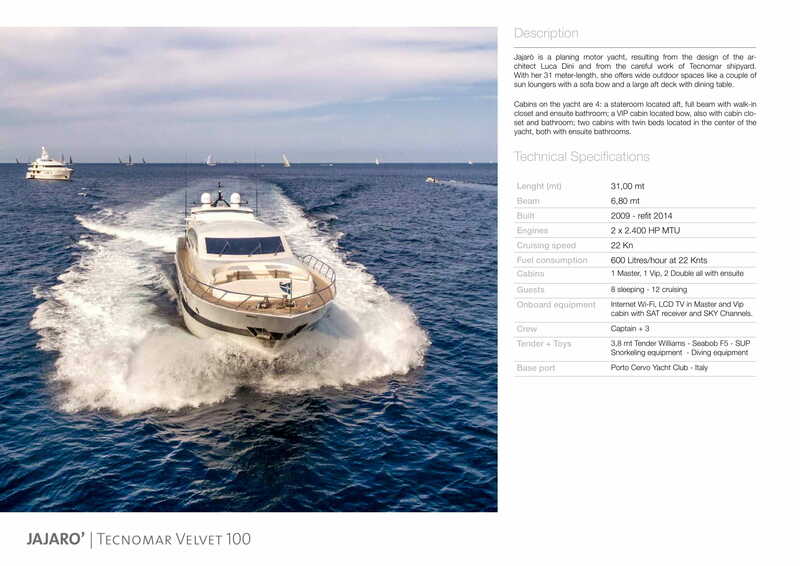 With its new generation engines have very low fuel consumption at a speed of 23 knots, offering a unique cruise experience.